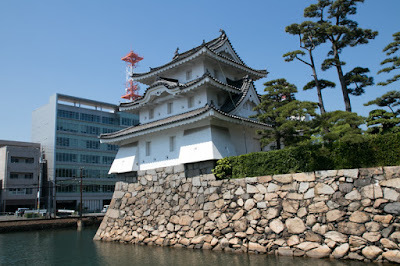 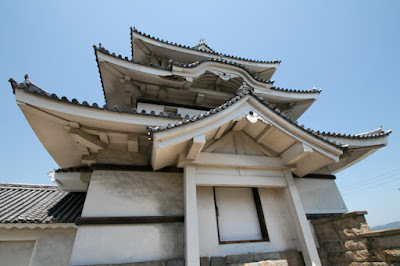 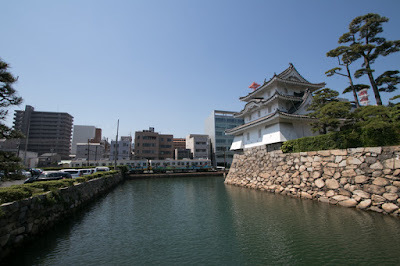 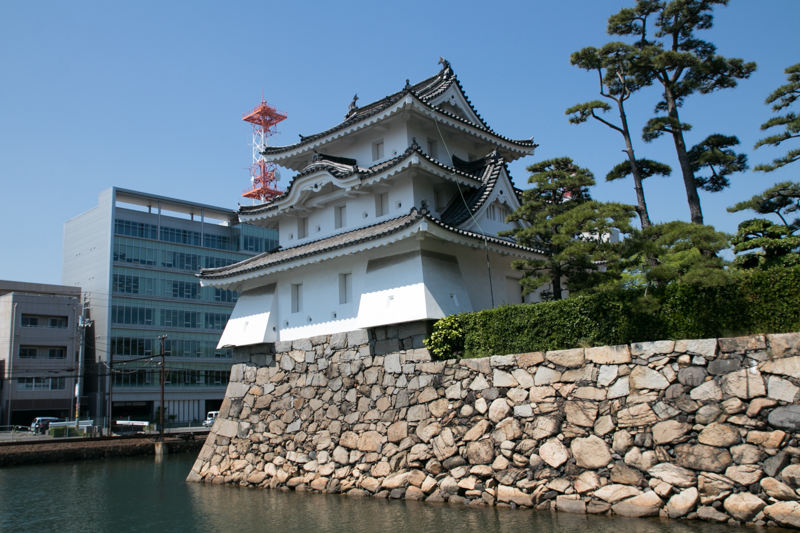 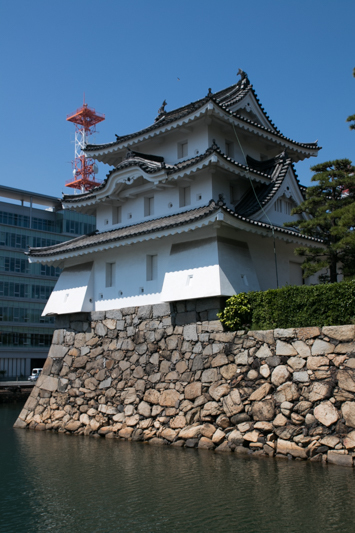 Takamatsu castle (高松城) is located at central Takamatsu city, in front of Takamatsu port. 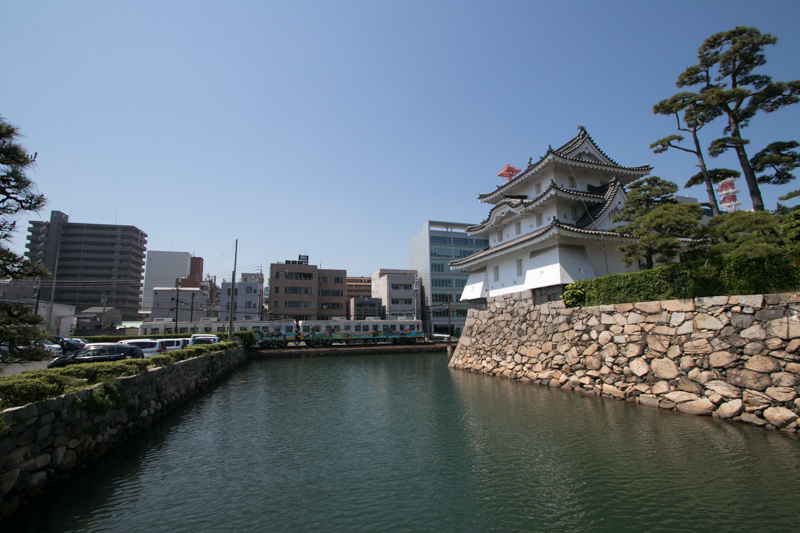 Takamatsu city is located at Takamatsu plain, a major part of Sanuki plain along with Marugame plain and an economic center of Kagawa prefecture. 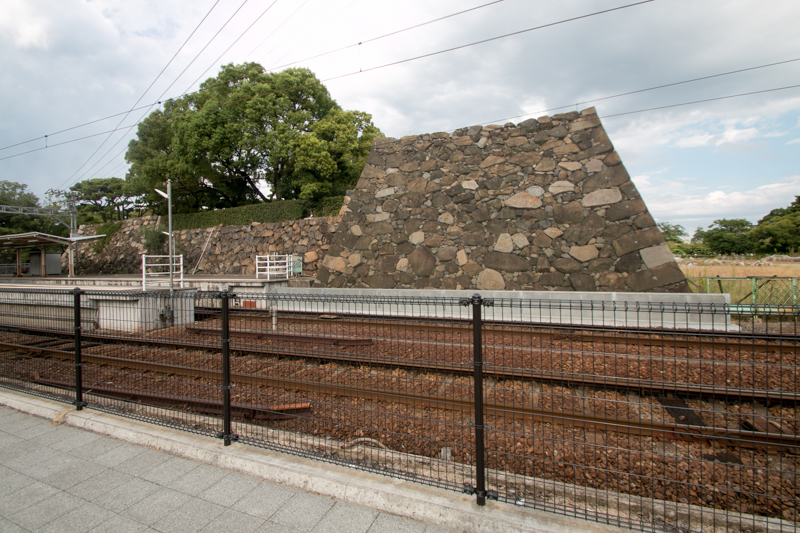 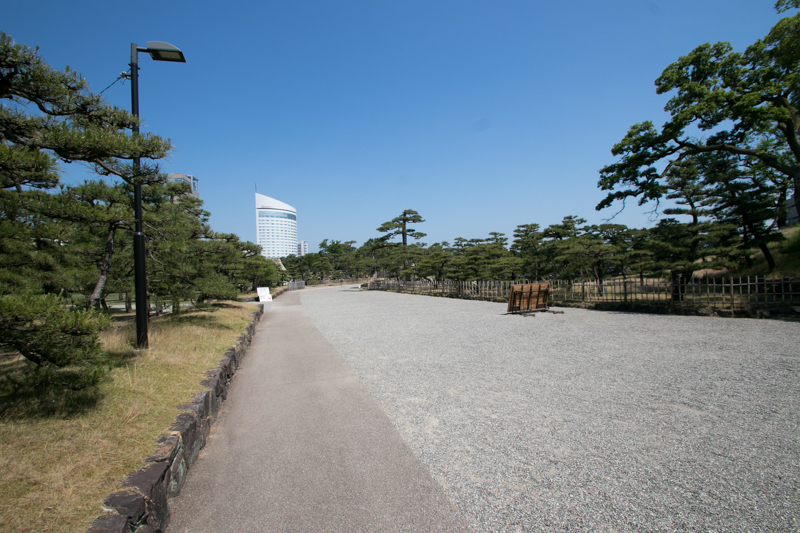 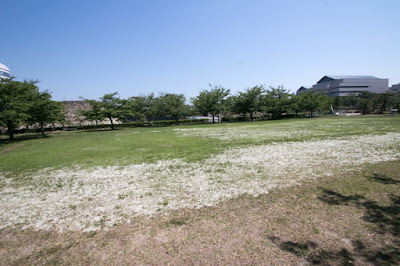 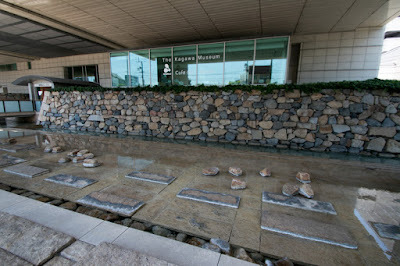 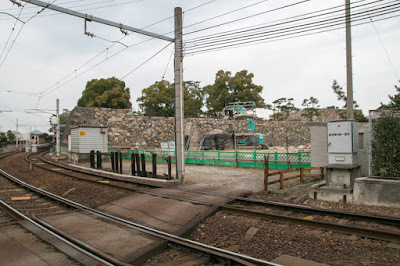 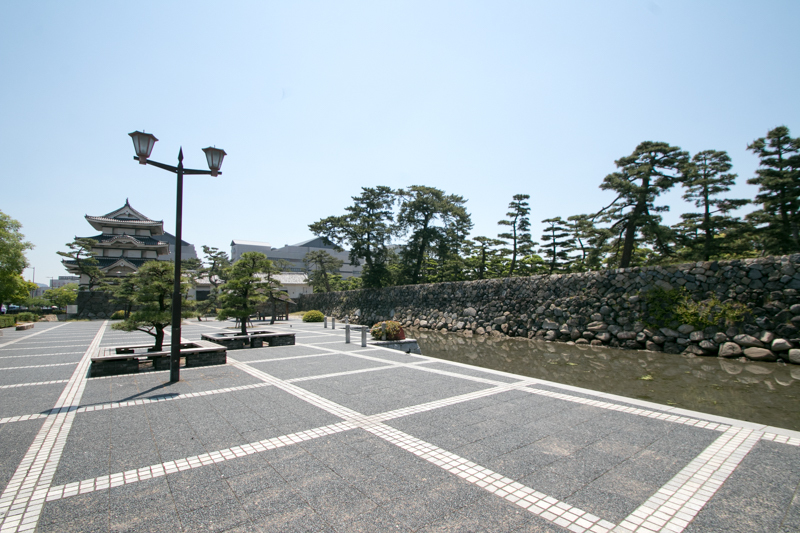 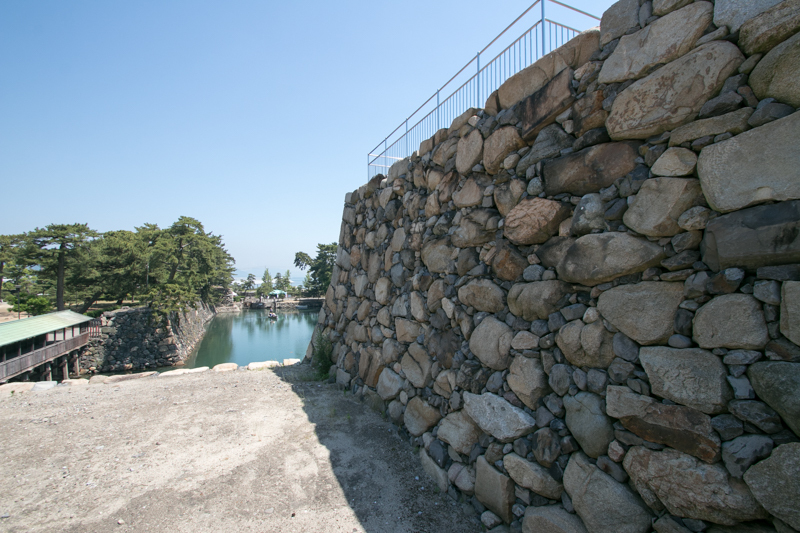 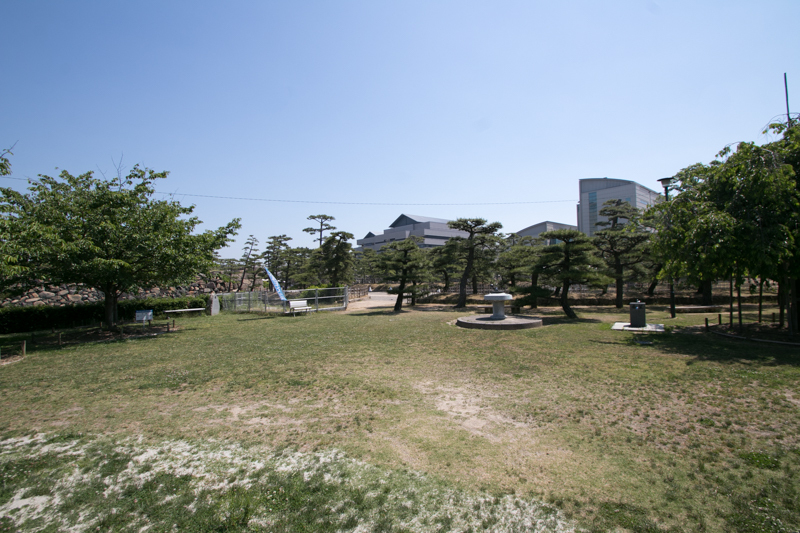 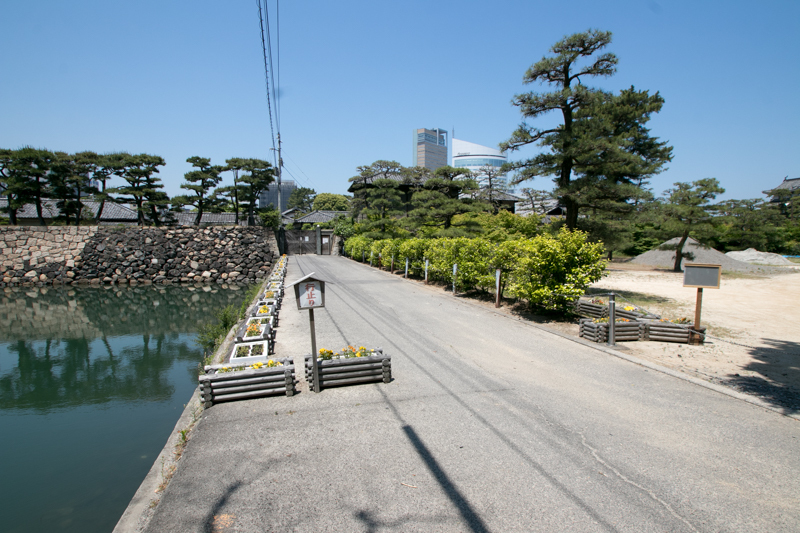 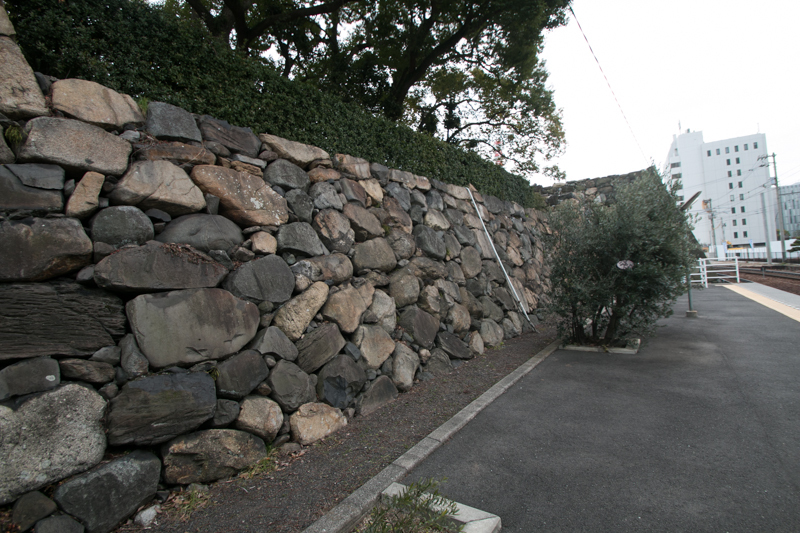 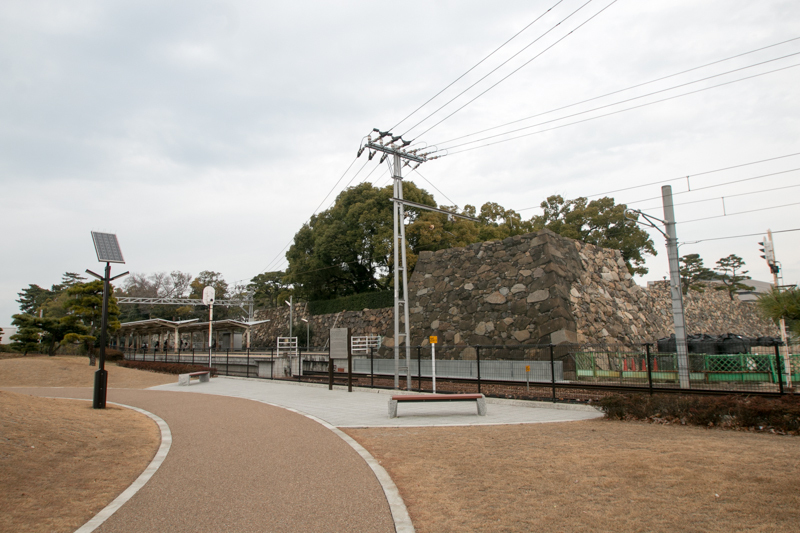 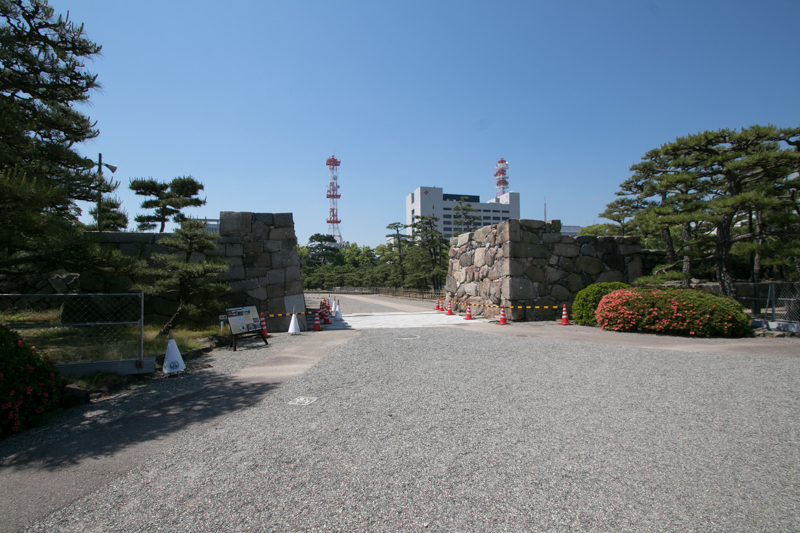 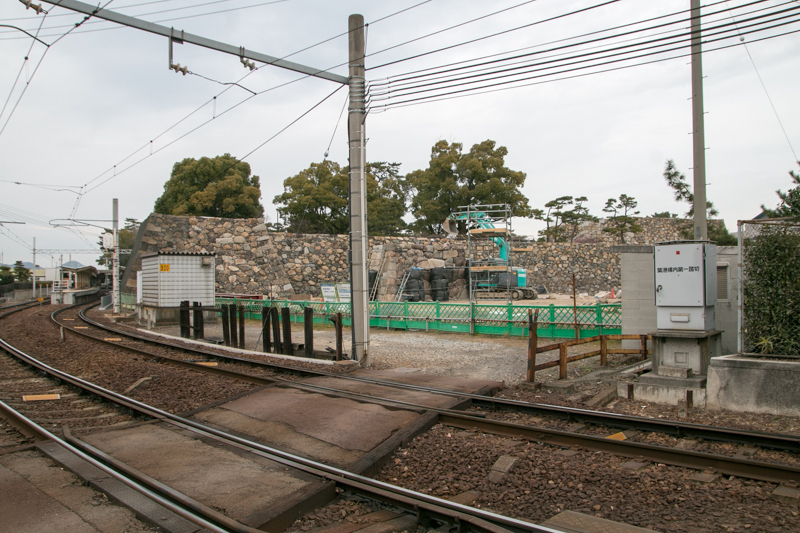 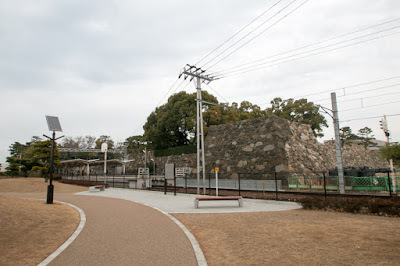 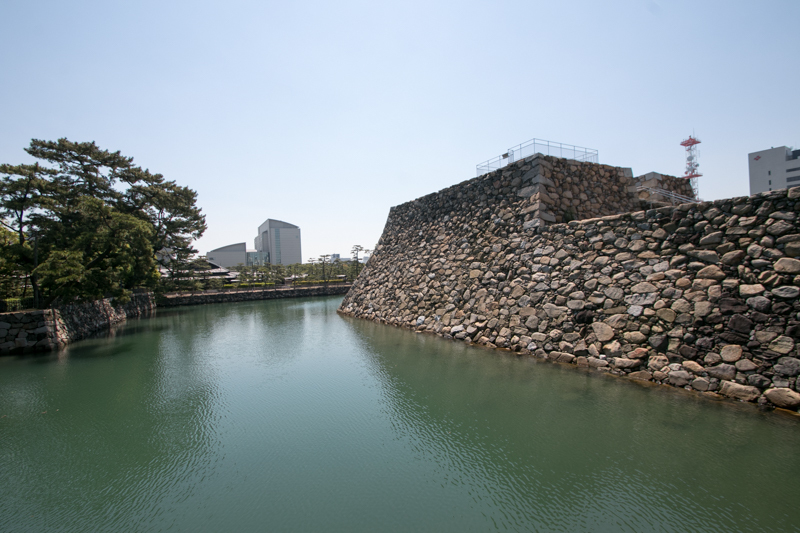 But Takamtsu city itself and Takamatsu castle was relatively newly developed area on and after 16th century. 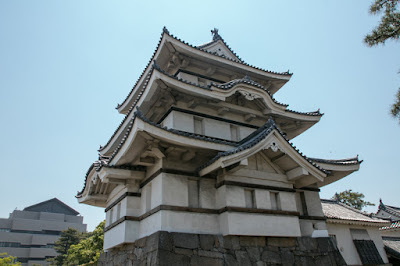 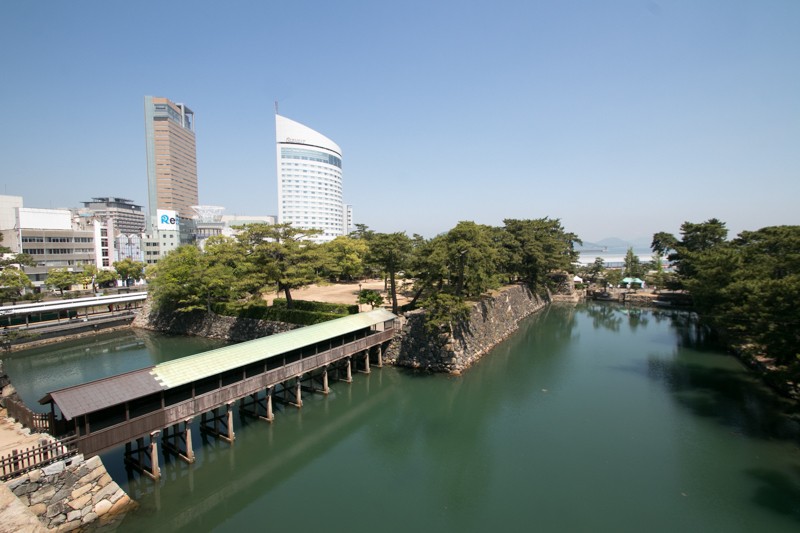 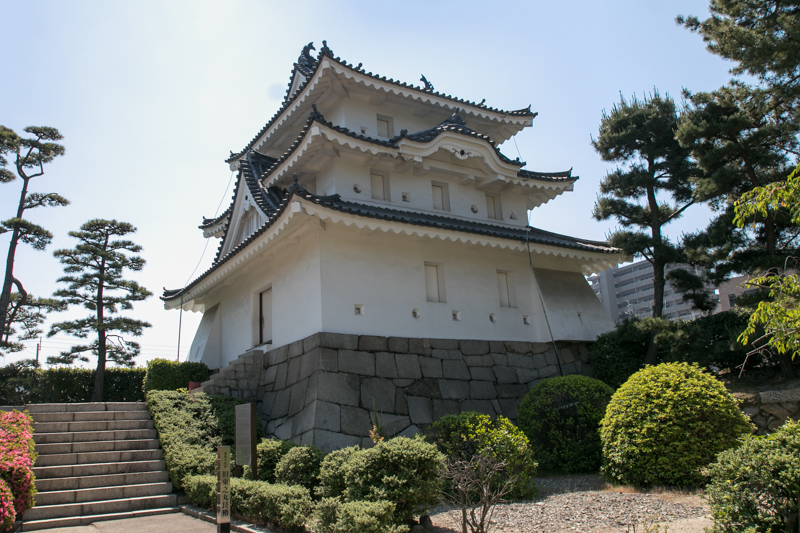 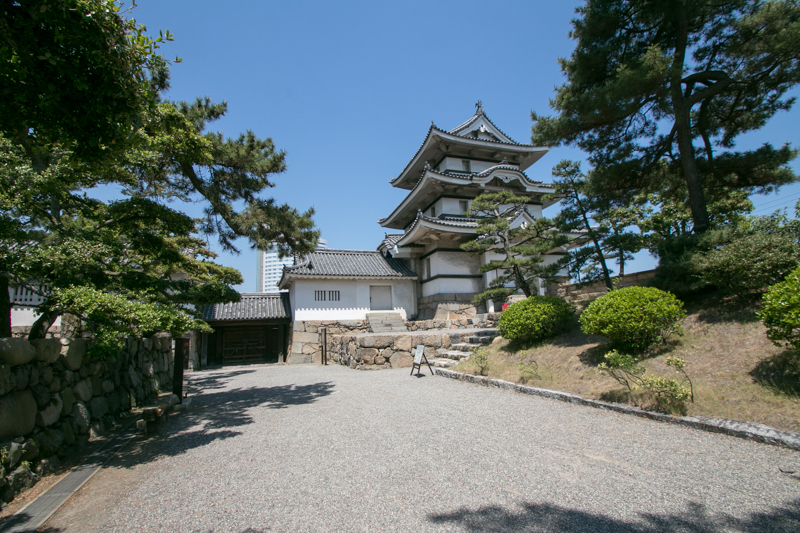 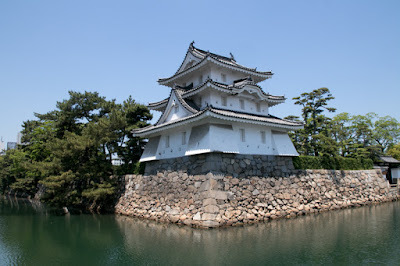 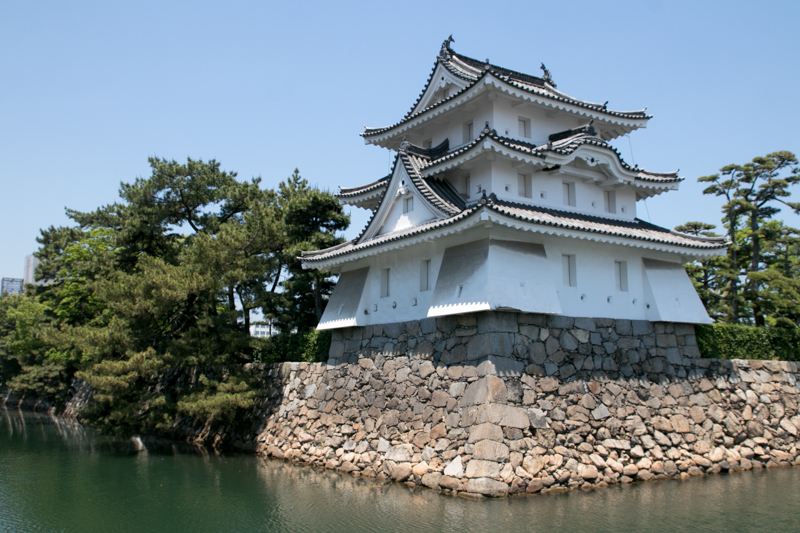 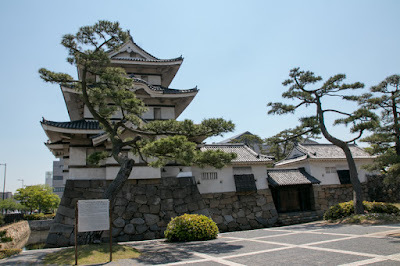 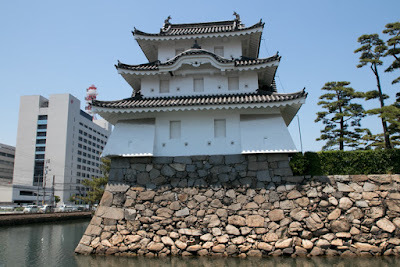 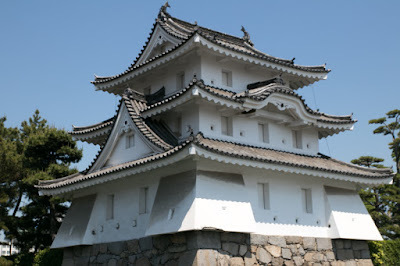 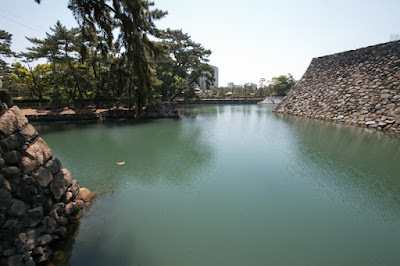 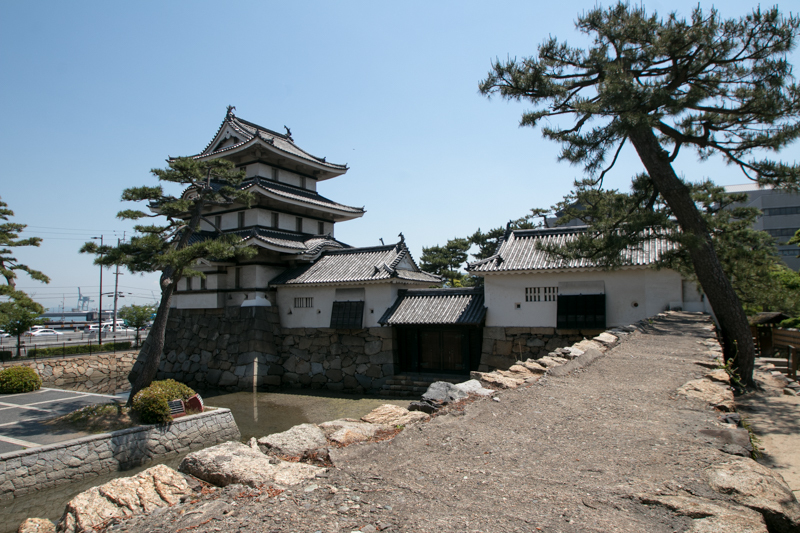 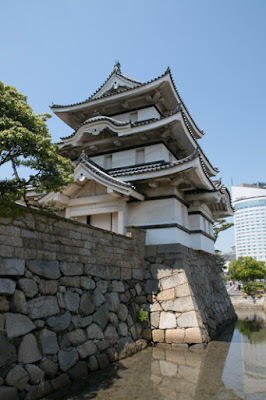 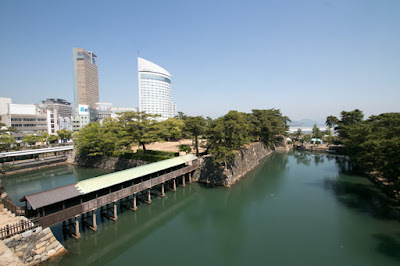 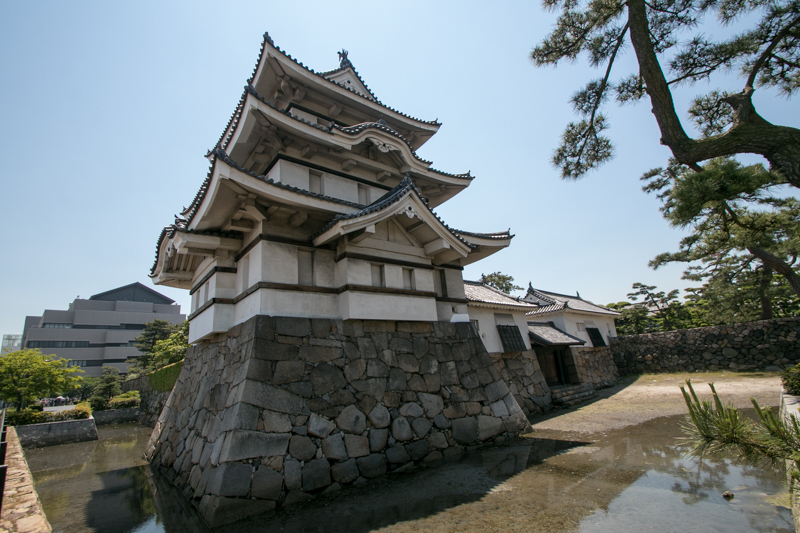 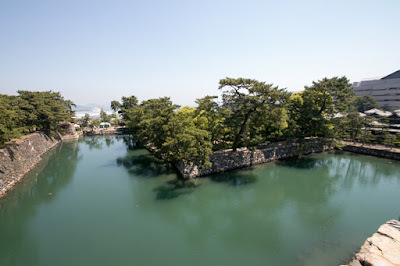 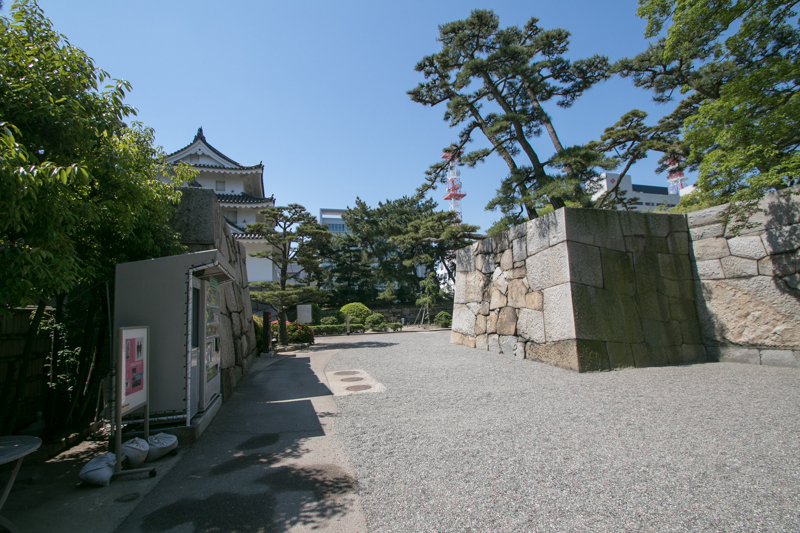 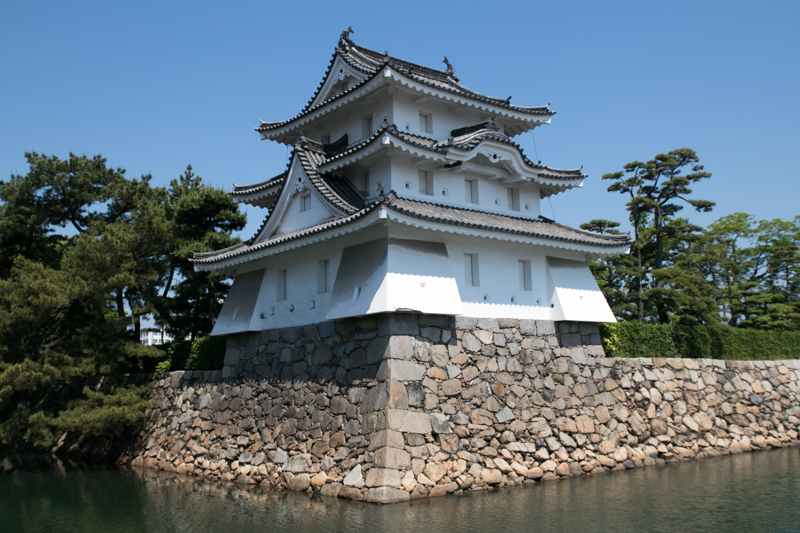 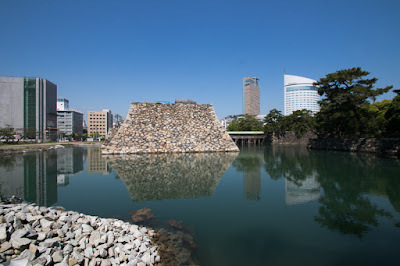 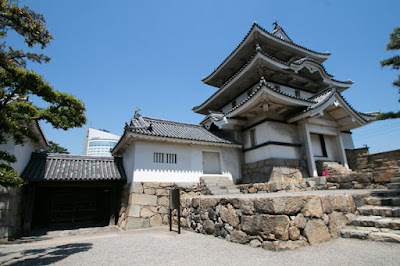 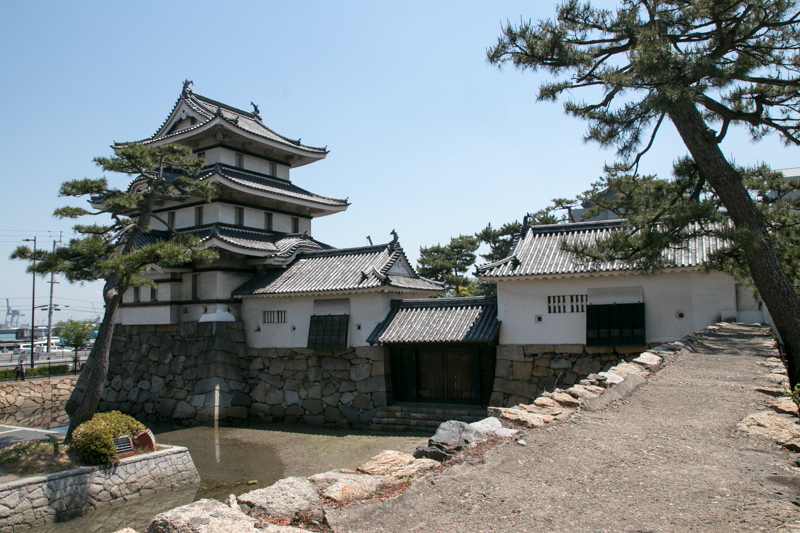 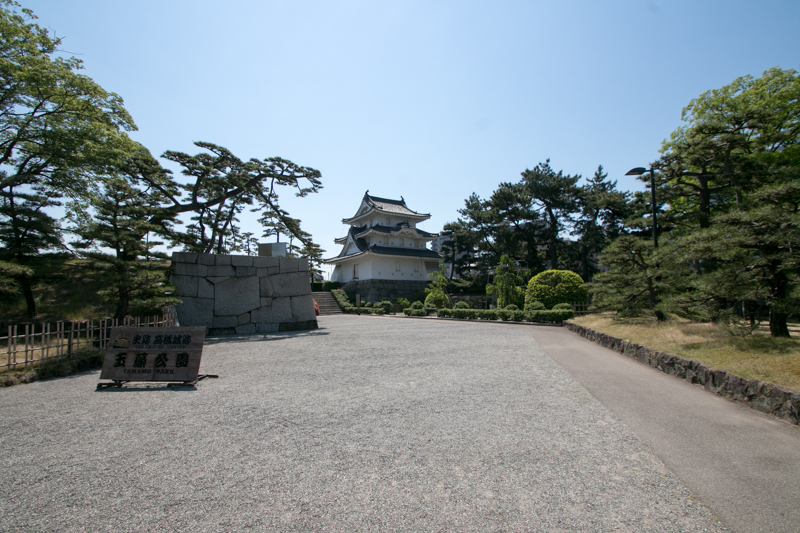 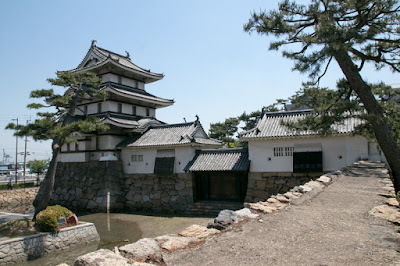 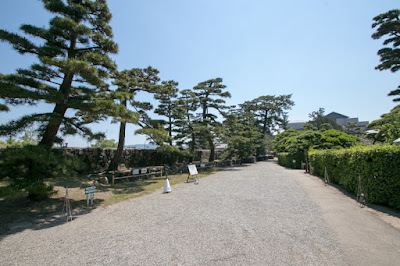 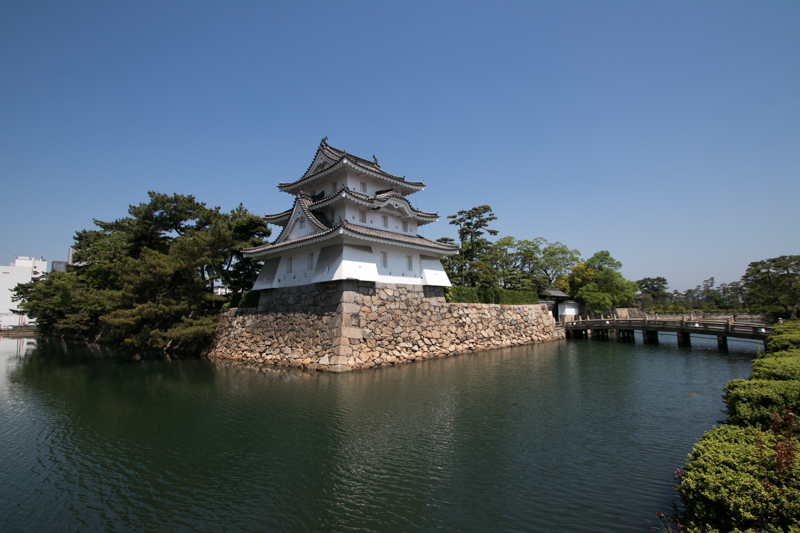 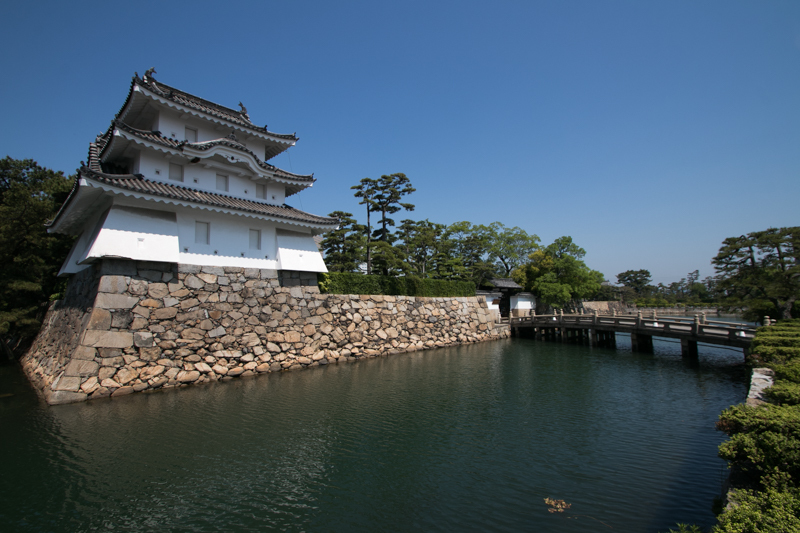 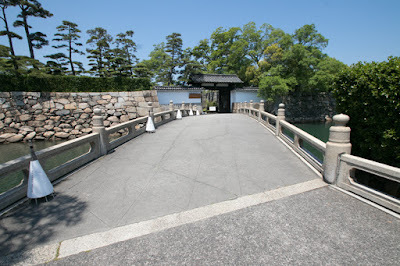 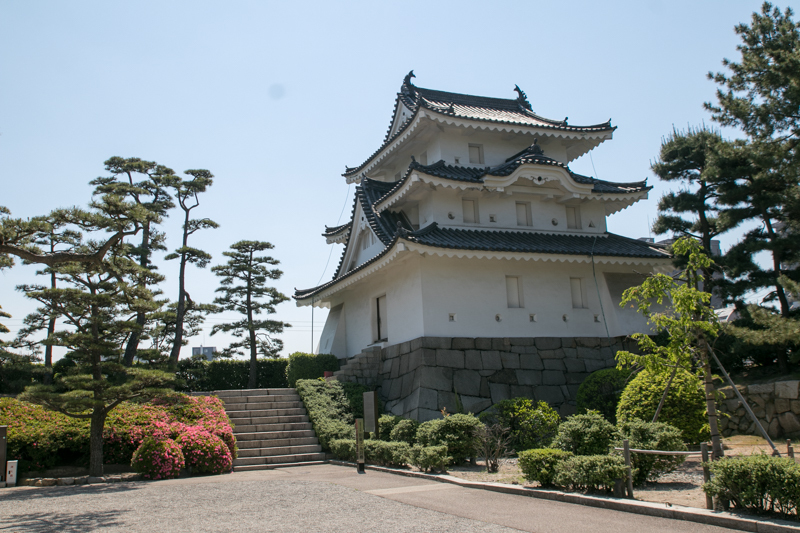 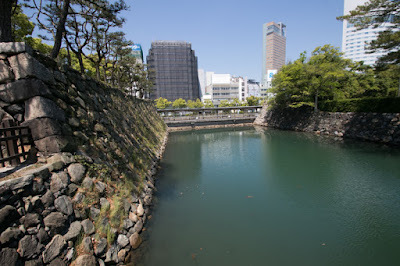 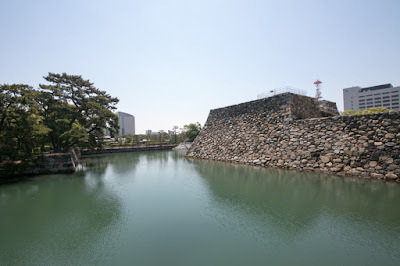 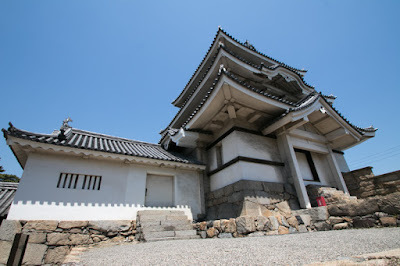 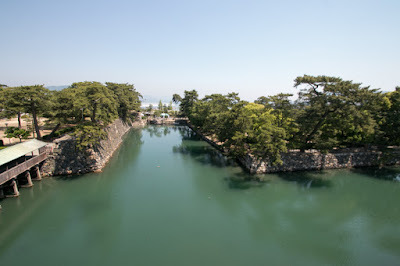 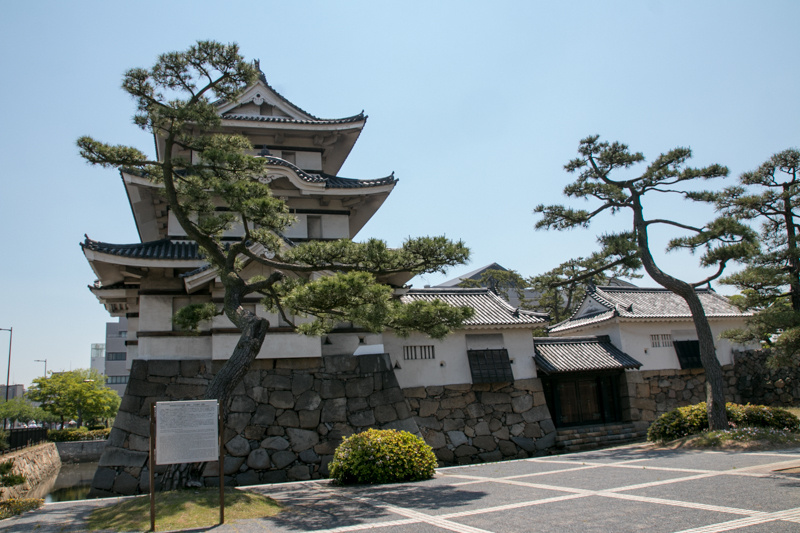 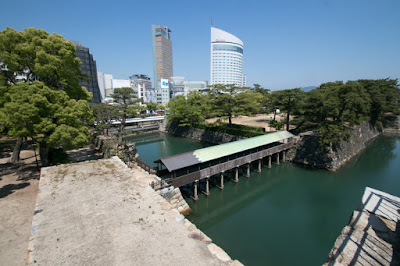 Takamatsu castle is a castle directly connected to the sea and regarded as three famous water castle along with Imabari castle (Ehime prefecture) and Nakatsu castle (Oita prefecture). 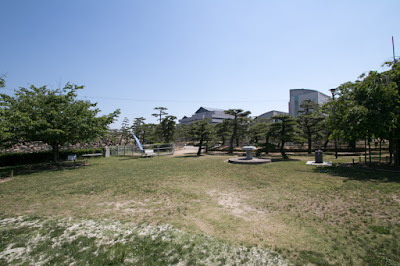 Historically the center of Sanuki country (Kagawa prefecture) was west part of current Takamatsu city and Sakaide city, the middle of Takamatsu plain and Marugame plain. In Muromachi era, Hosokawa clan, a relative family of Muromachi Shogunate and one of the highest rank retainer of Shogunate, governed Sanuki country along with Awa country. After the battle of Onin (1567-1577) Hosokawa clan once substantially seized the Shogunate, but due to internal conflict the clan significantly lost their authority and replaced by their retainer Nagayoshi Miyoshi (1522-1564). In Sanuki country, Hosokawa clan appointed Kouzai clan and Yasutomi clan as a deputy governor of west half and east half of the country. After the fall of Hosokawa clan, Kazumasu Sogo (1532-1561), the younger brother of Nagayoshi Miyoshi, was adopted by Sogo clan and once governed Sanuki country. 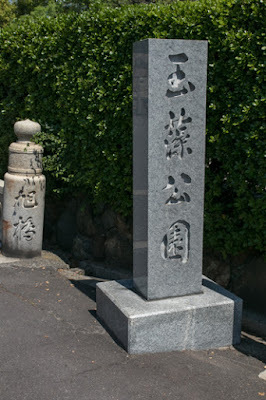 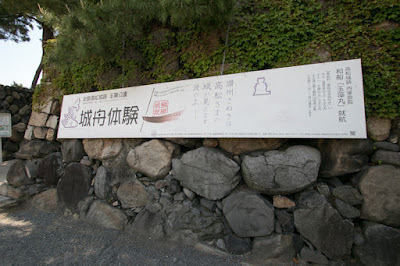 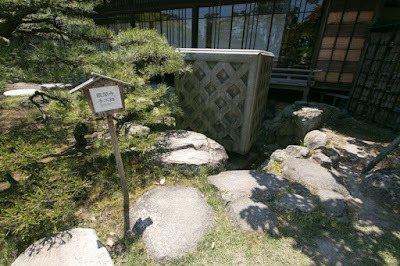 But Kazumasu died by ill in youth, and his nephew Masayasu Sogo (1554-1587) succeeded Sogo clan. Masayasu struggled to keep Sanuki country, but on and after 1570's Motochika Chosokabe (1539-1599), a warlord of Tosa country (Kochi prefecture), started his campaign to unite Shikoku island. 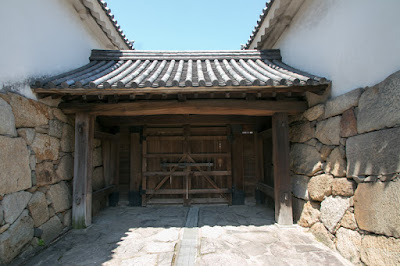 Finally Sogo clan lost their castle, and Kozai clan or Yasutomi clan surrendered to Chosokabe clan. 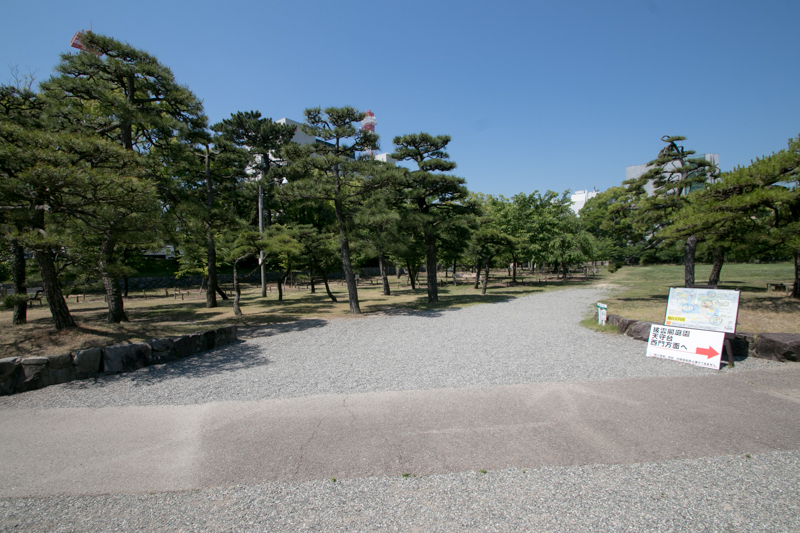 But Chosokabe clan itself was defeated by central ruler Hideyoshi Toyotomi (1537-1598) and lost Sanuki country. 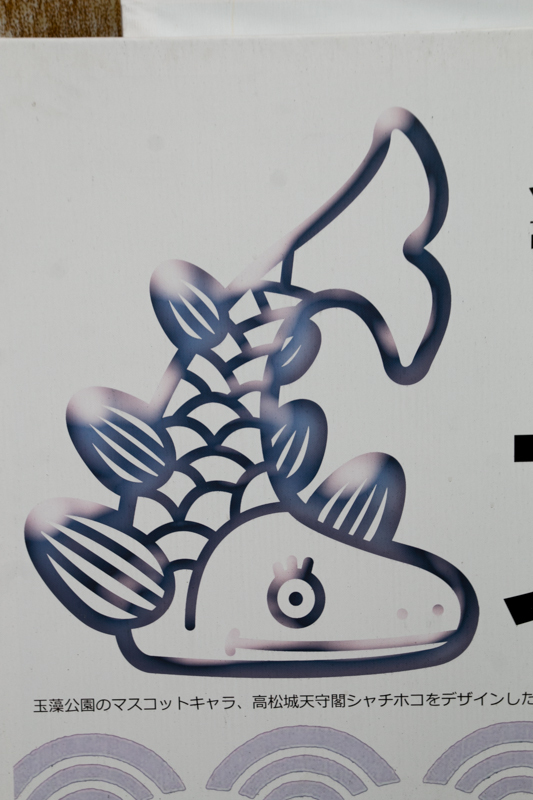 Toyotomo government highly depended on the economic basis of Kinki region, and to keep the economy of Kinki region, sea lane of Setonaikai sea connected Osaka city and Hakata city should be kept safe. 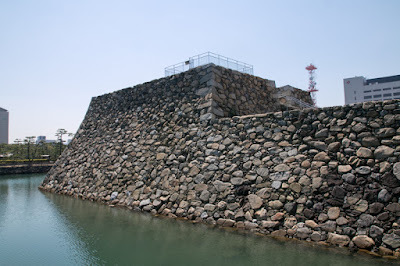 Around Setonaikai sea, Chugoku region was already held by Mouri clan and Ukita clan which were intimate to Toyotomi government, thus Toyotomi clan had to secure the north shore of Shikoku island and Kitakyushu area. 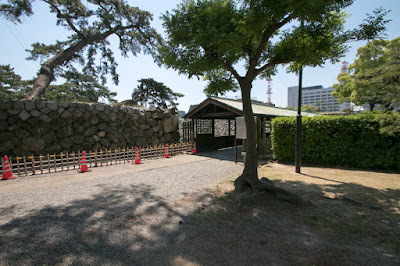 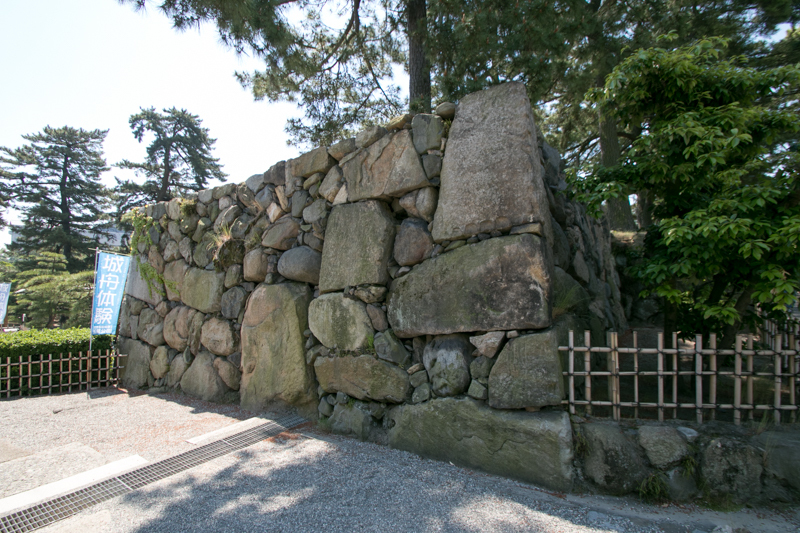 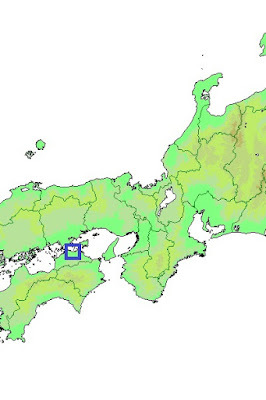 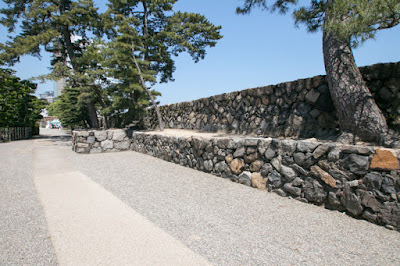 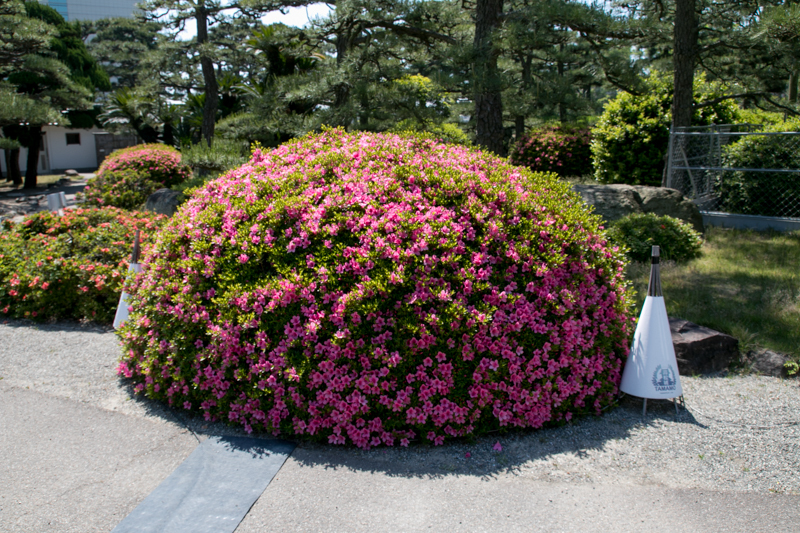 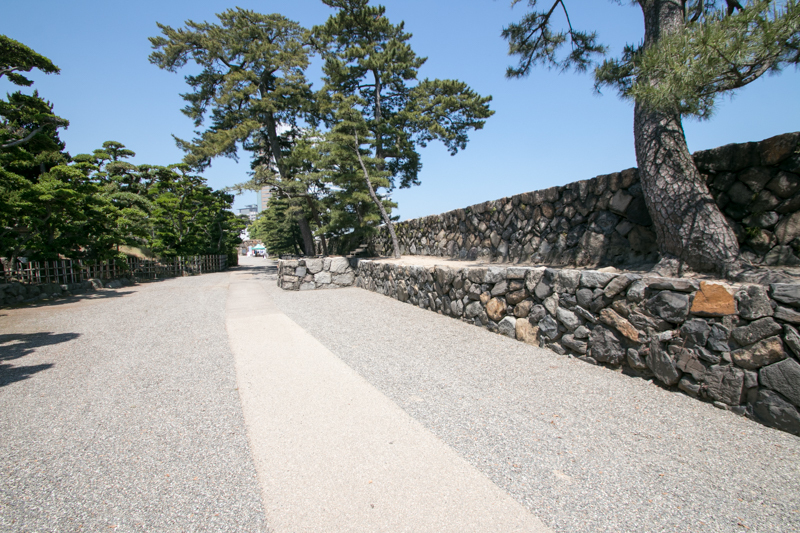 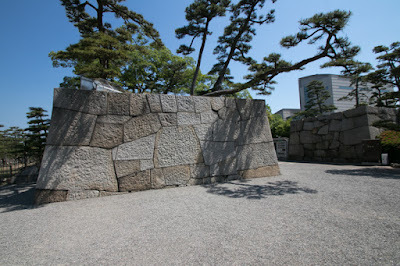 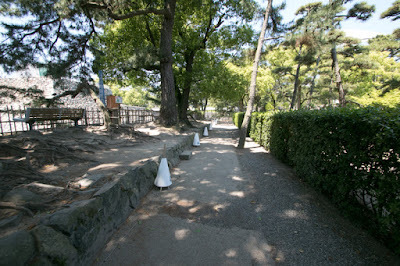 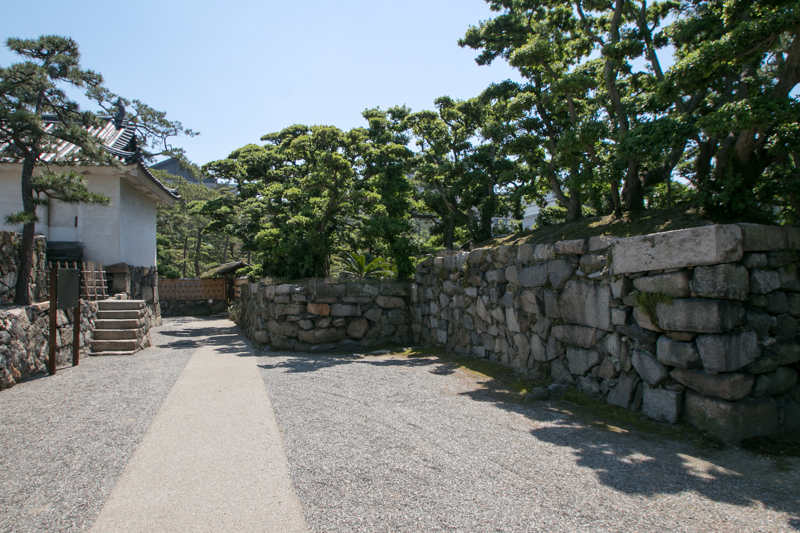 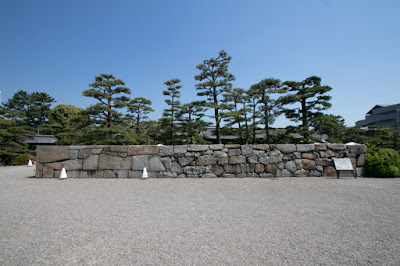 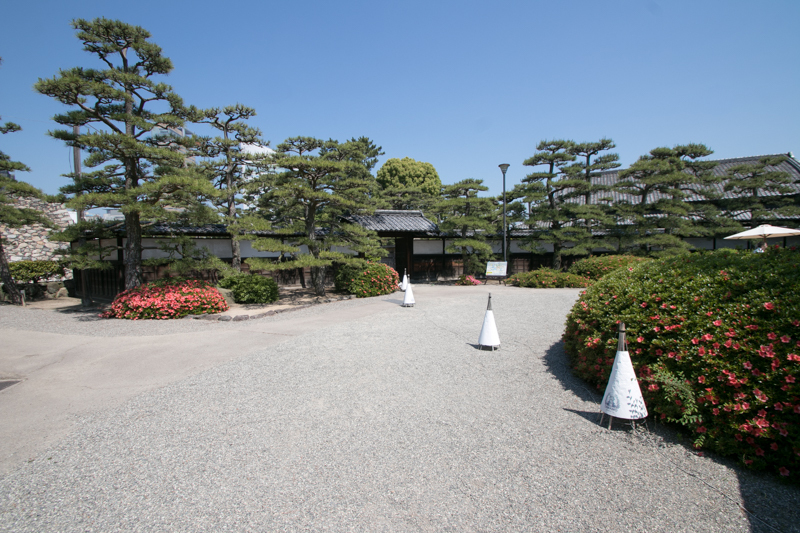 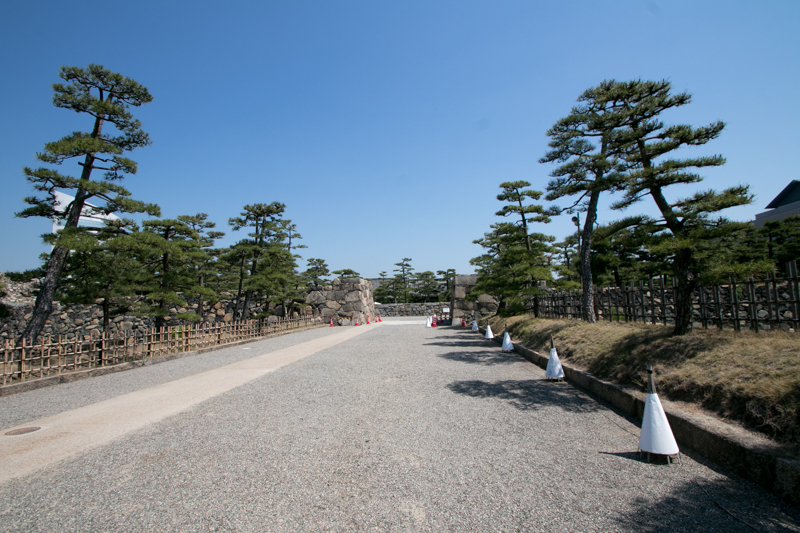 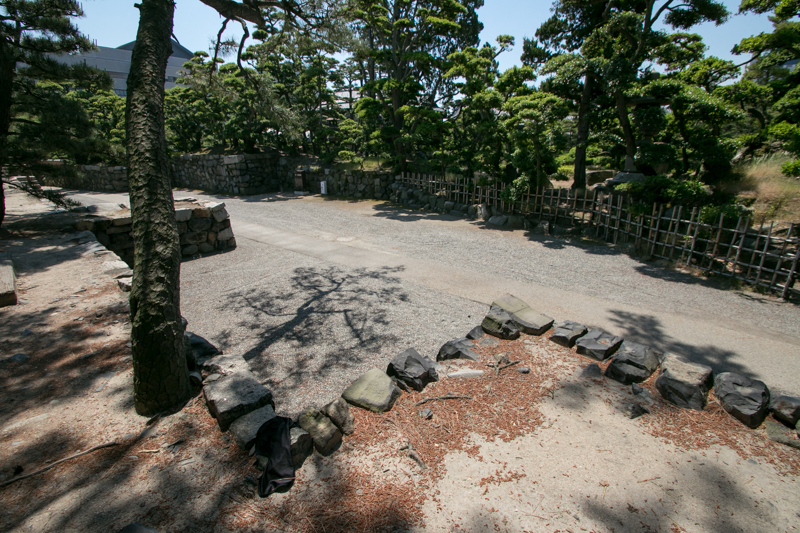 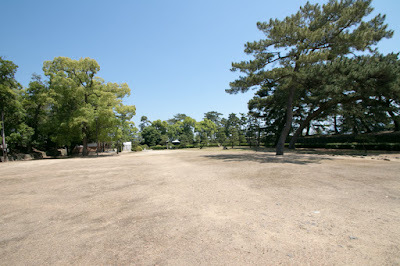 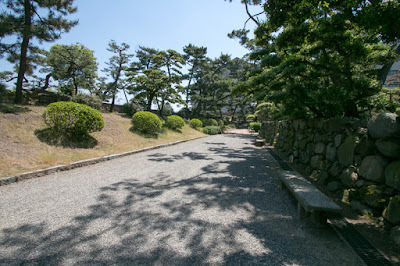 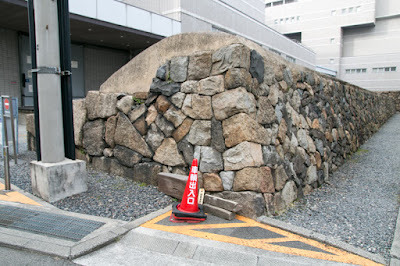 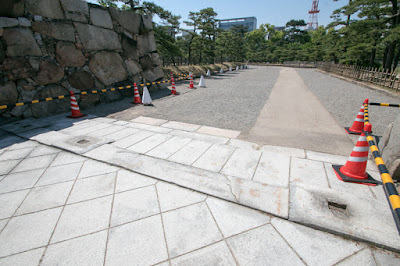 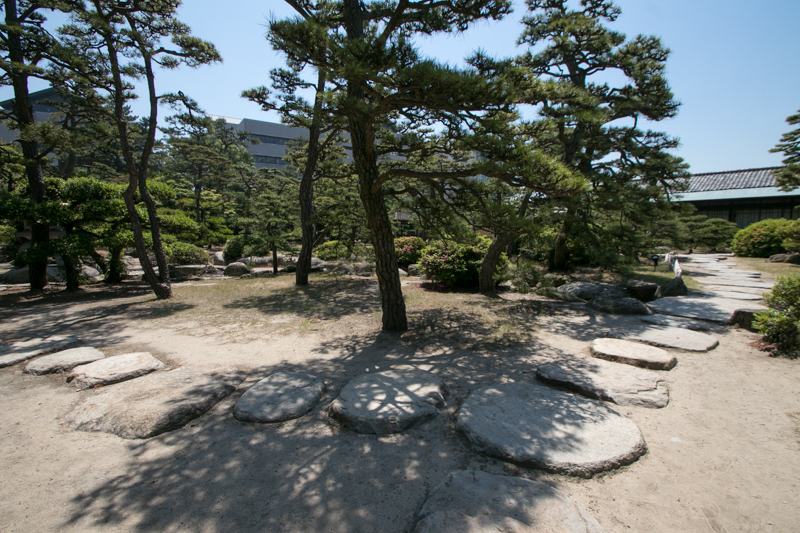 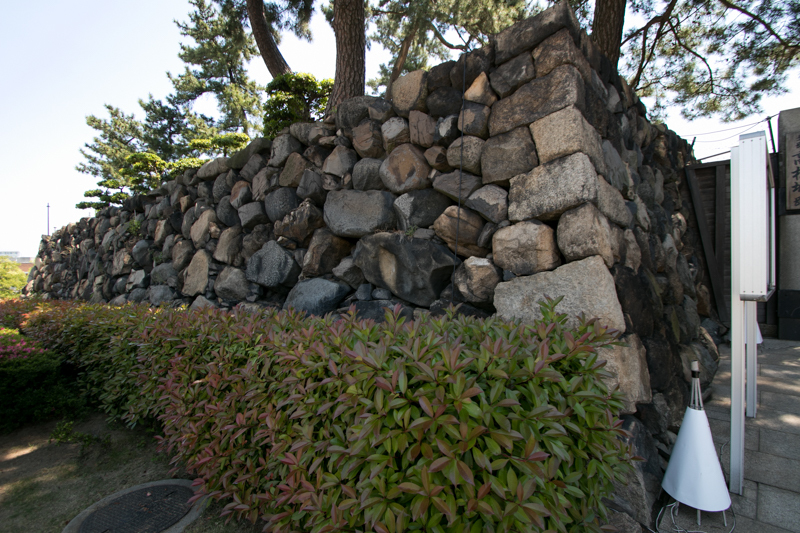 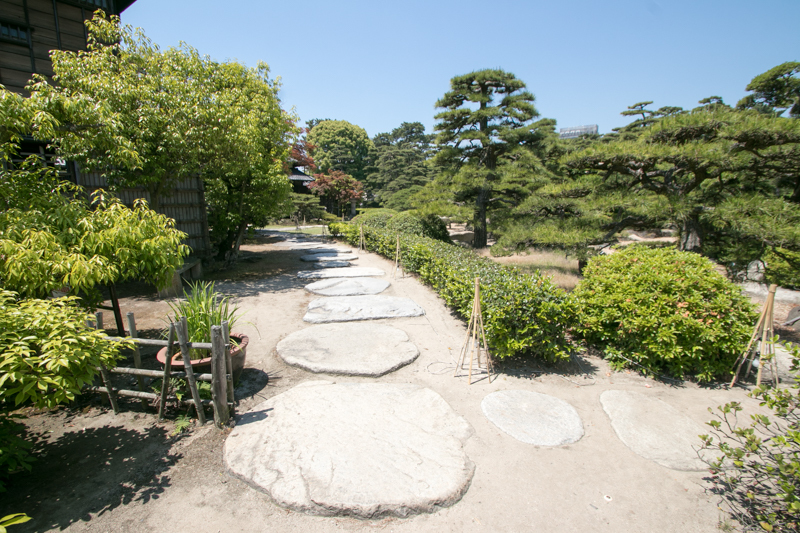 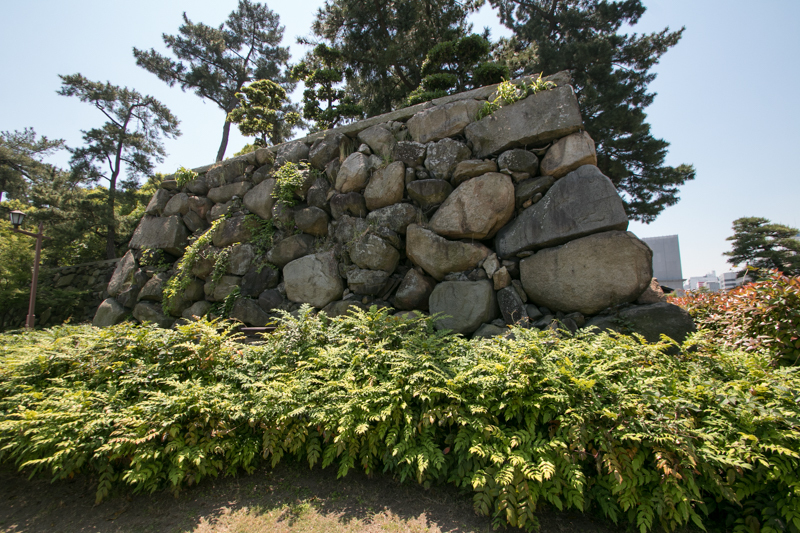 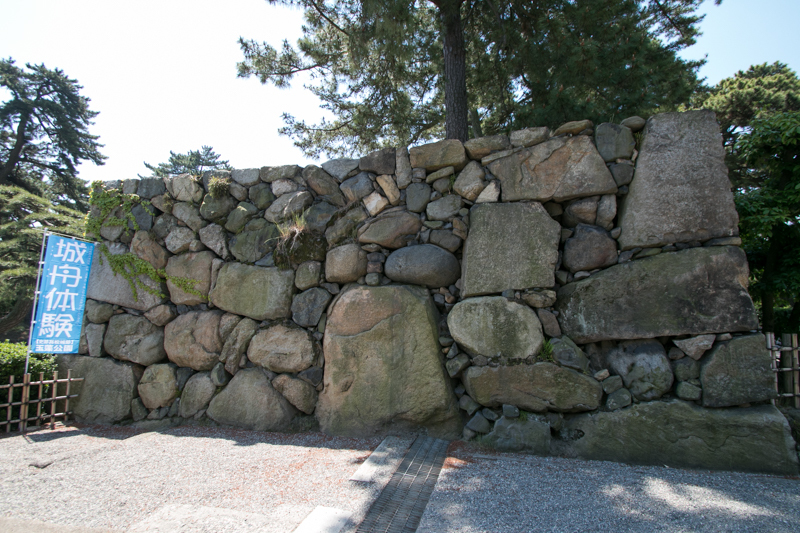 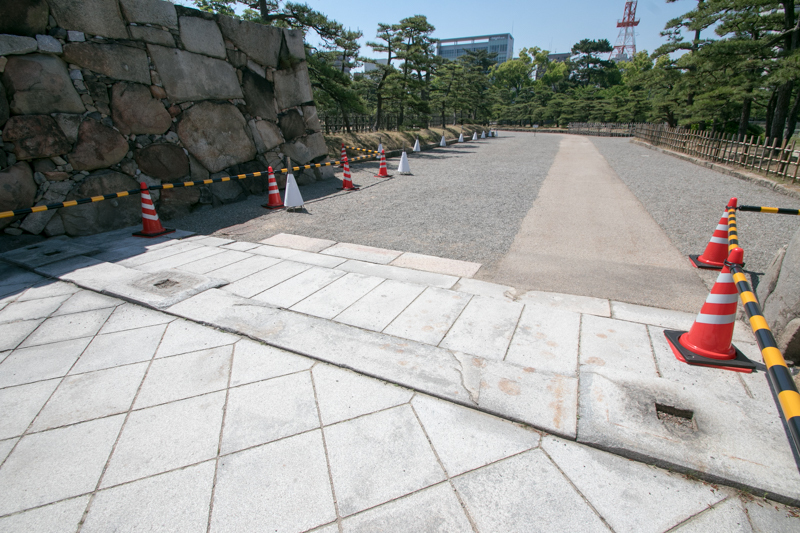 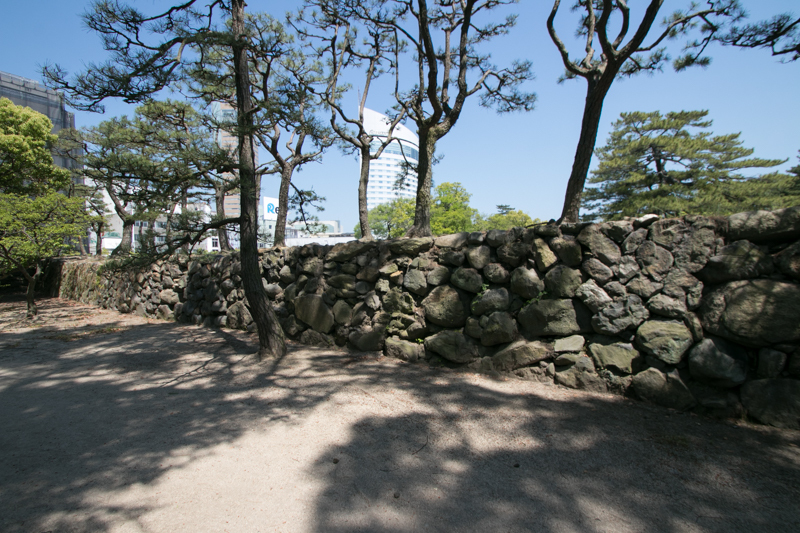 Based on above policy, Hideyoshi placed his hereditary retainers around this area. Awa province was held by Iemasa Hachisuka (1558-1639), son of Masakatsu Hachisuka (1526-1586, famous as Koroku) who was the oldest staff of Hideyoshi, and Sanuki province was given to Chikamsa Ikoma (1526-1603), who relates Ikoma clan by which Hideyoshi was hired by his former master Nobunaga Oda (1534-1582). 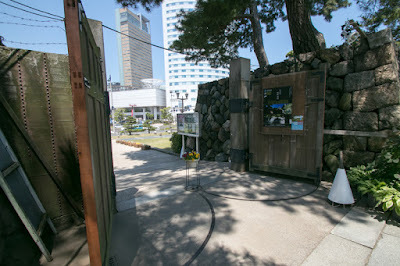 Iyo province was divided to younger generation generals such as Masanori Fukushima (1561-1624), Takatora Todo (1556-1630) or Yoshiakira Kato (1563-1631), and Kitakyushu area and Hakata area were managed respectively by Yoshitaka Kuroda (1546-1604, famous as Kanbe) and Takakage Kobayakawa (1533-1597), both the important person of Toyotomi government. 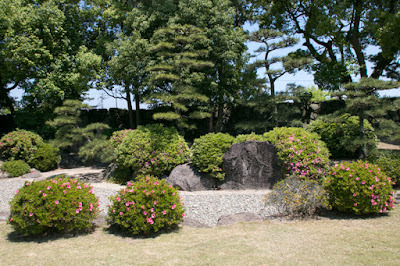 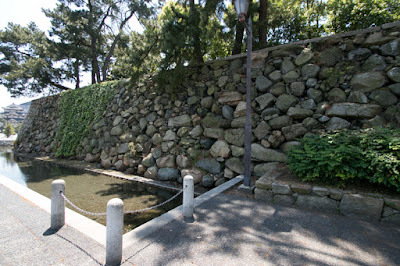 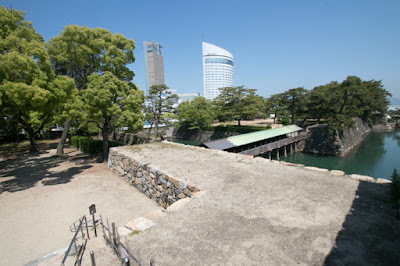 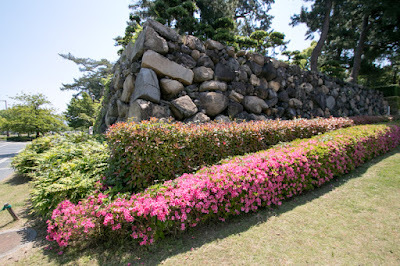 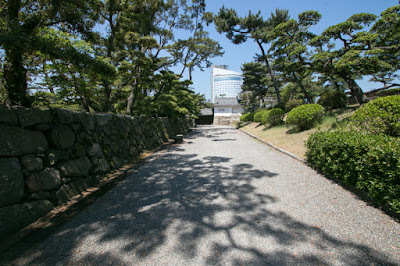 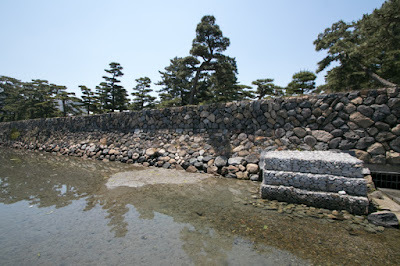 Three famous water castle locate at the coast of Setonaikai sea and built by above retainers (Takamatsu castle by Chikamasa Ikoma, Imabari castle by Takatora Todo and Nakatsu castle by Yoshitaka Kuroda) around 1590, and this is not a coincidence but based on the policy of Hideyoshi to keep the security of Setonaikai sea. 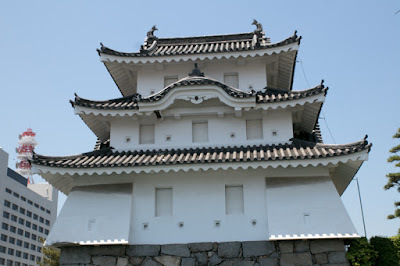 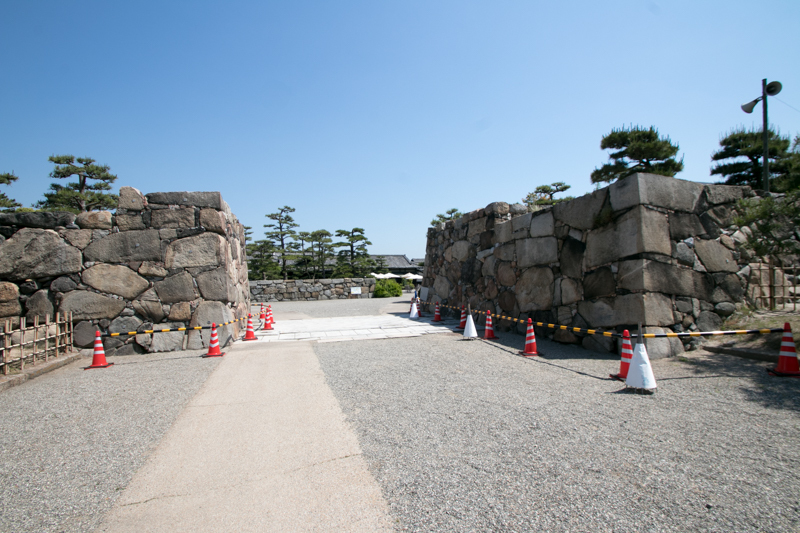 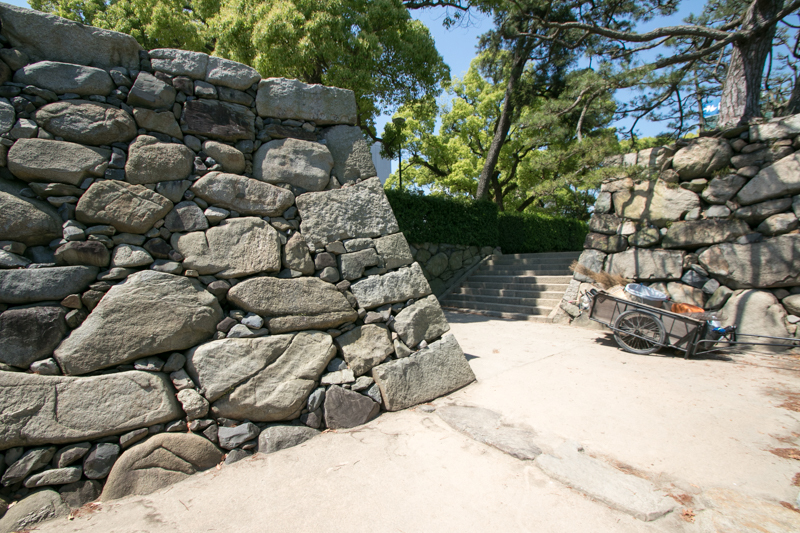 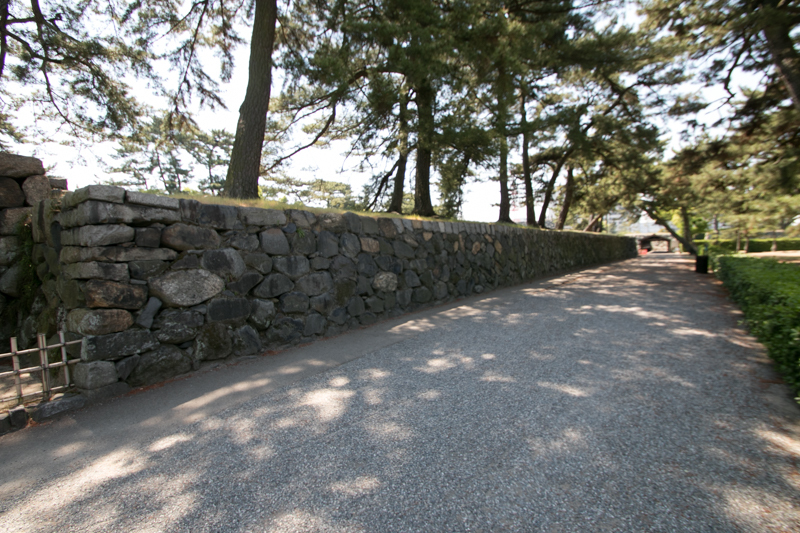 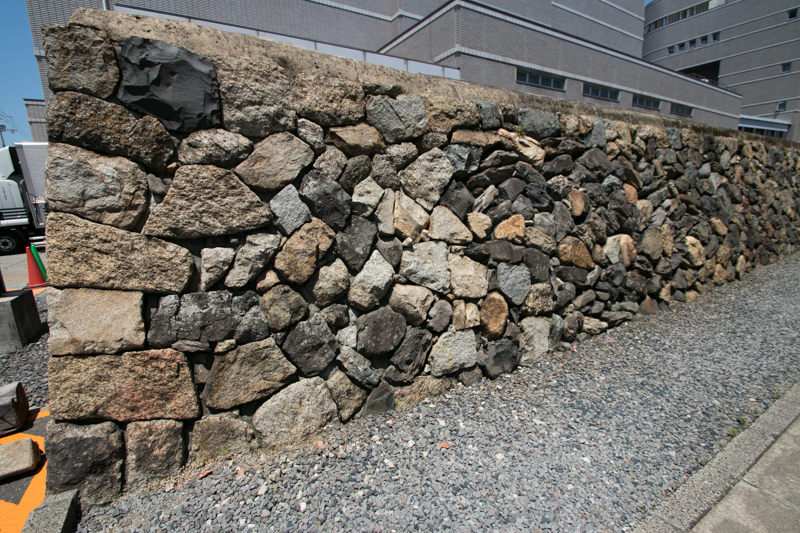 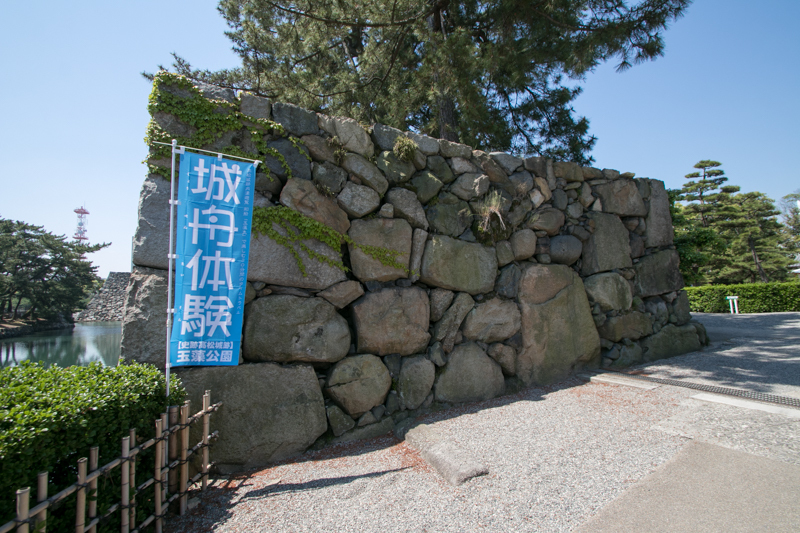 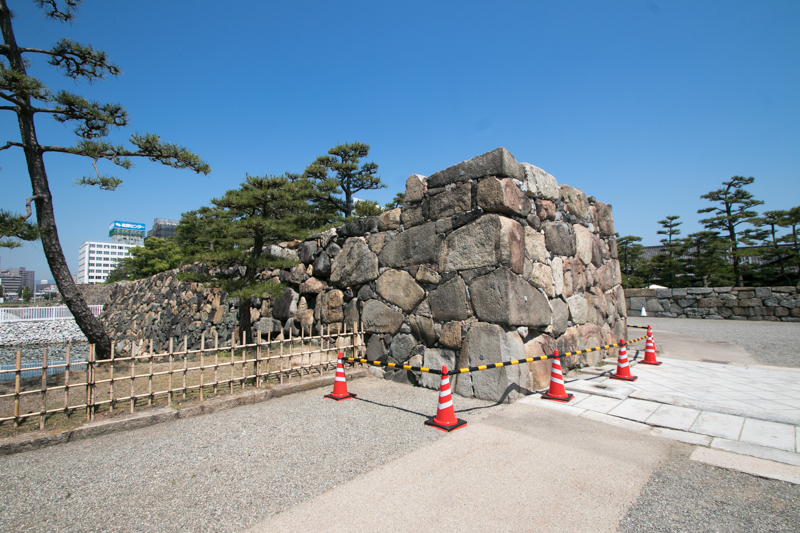 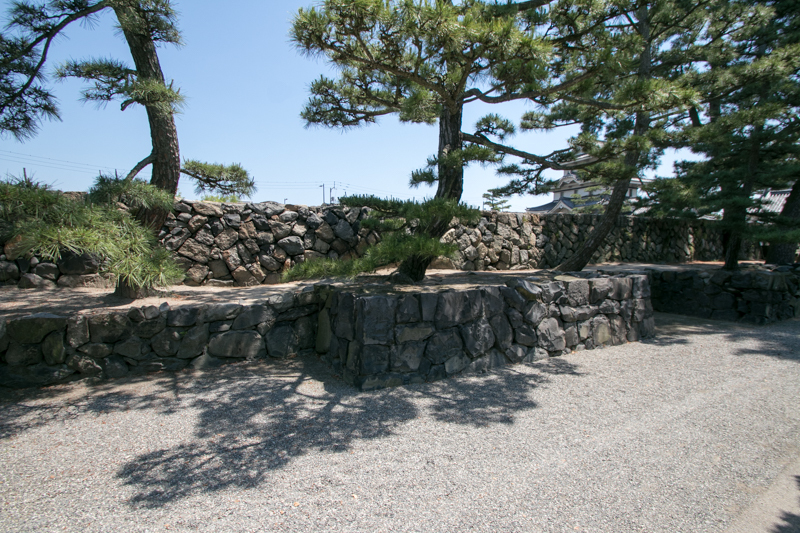 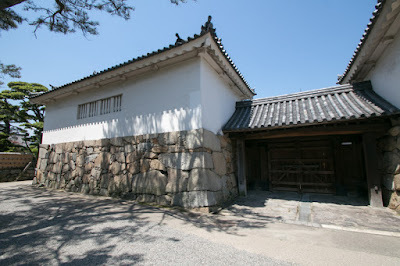 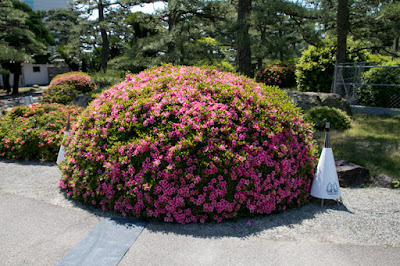 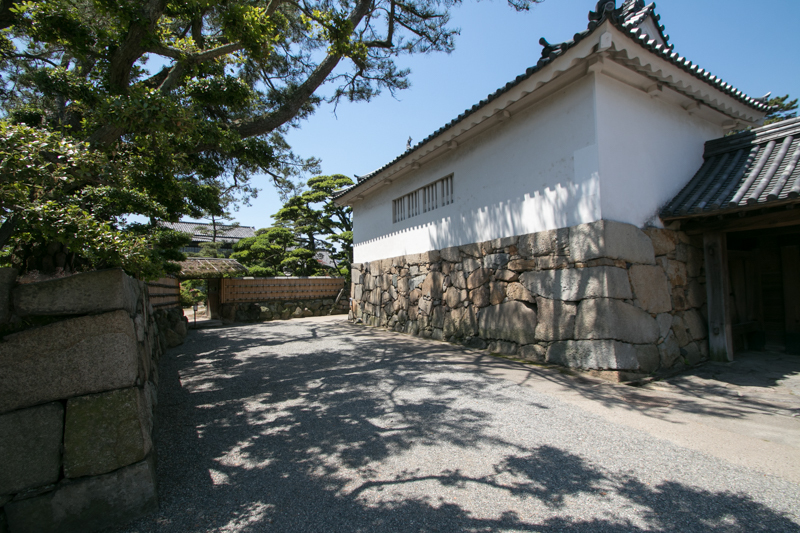 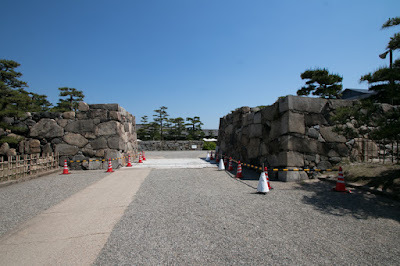 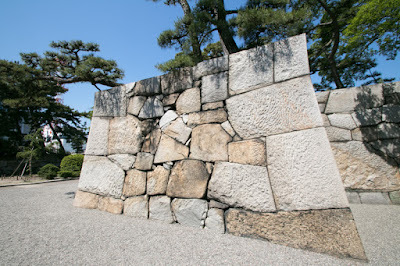 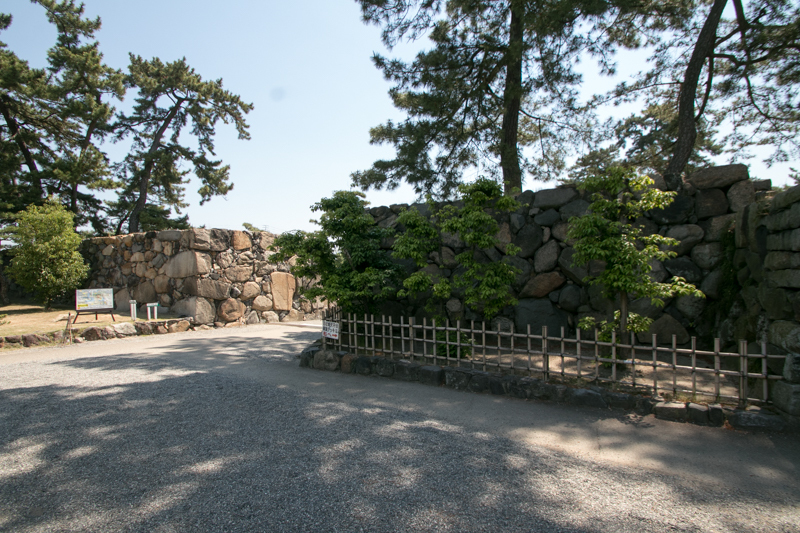 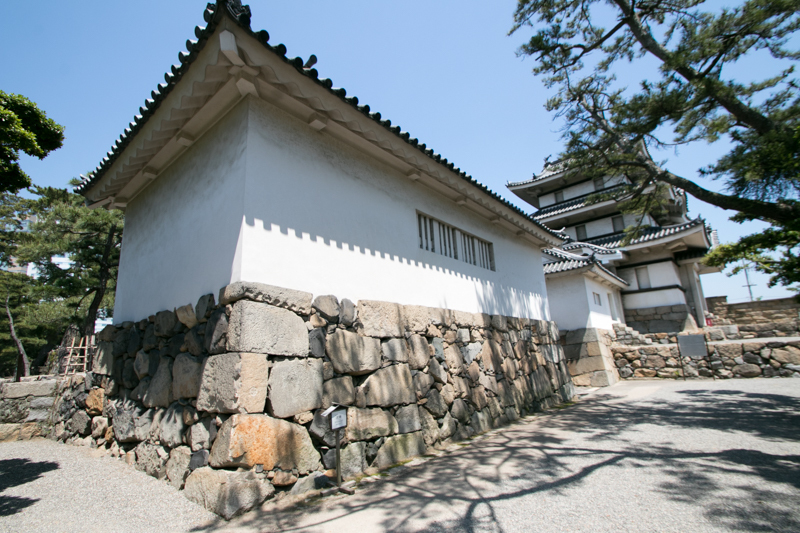 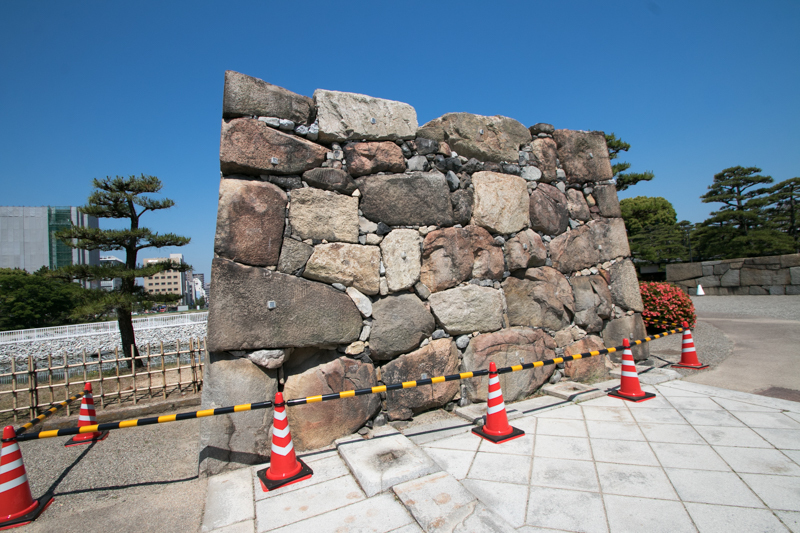 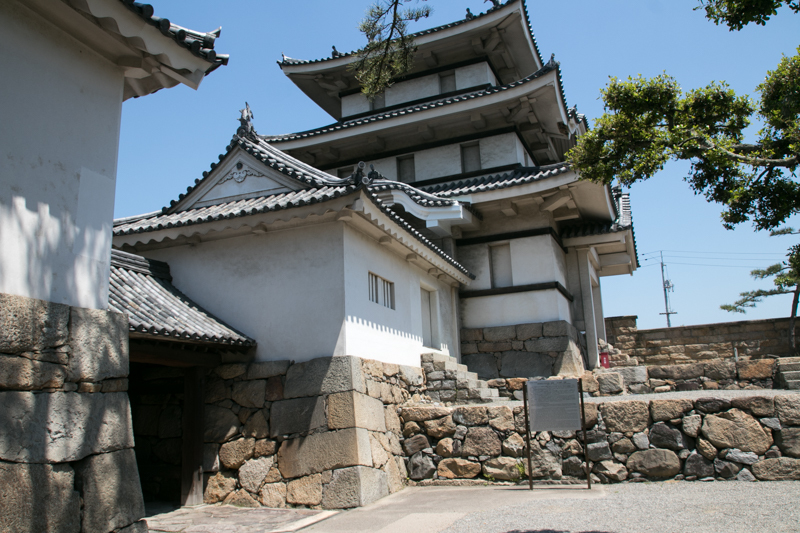 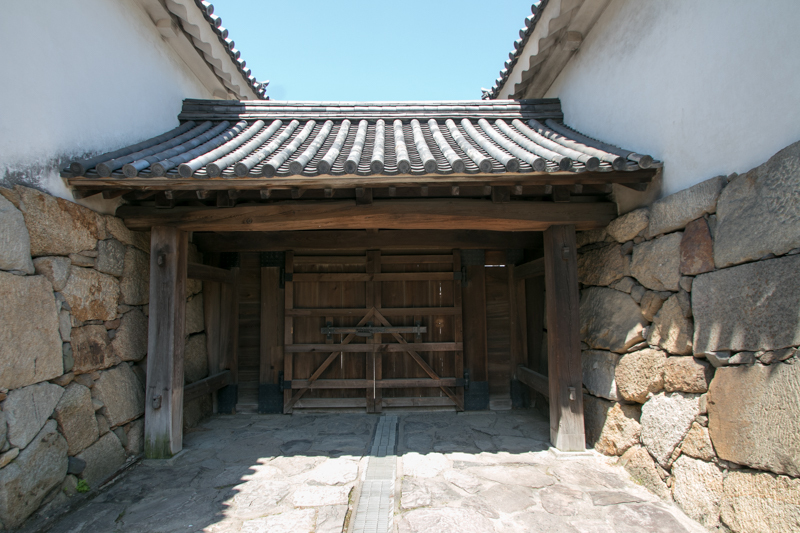 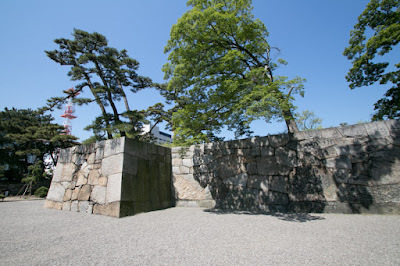 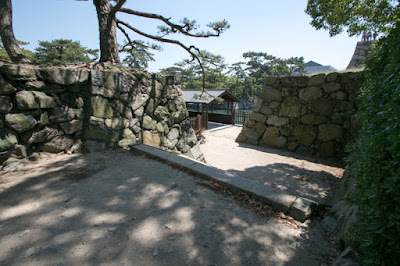 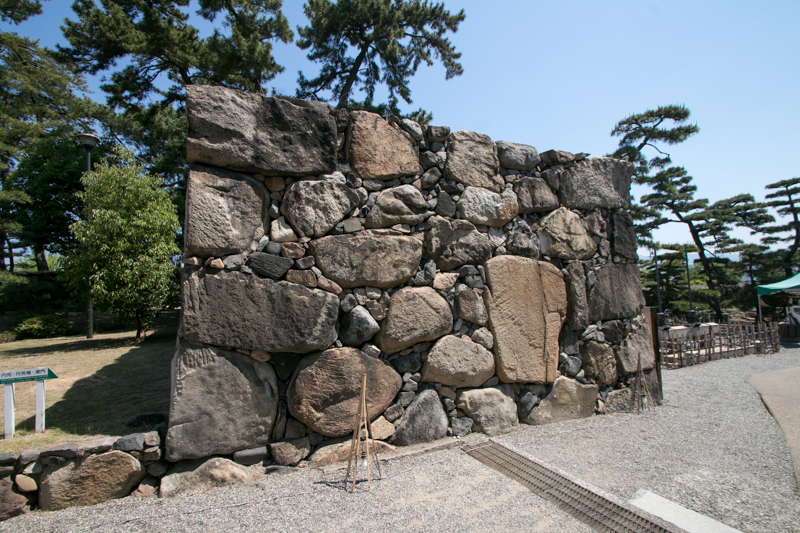 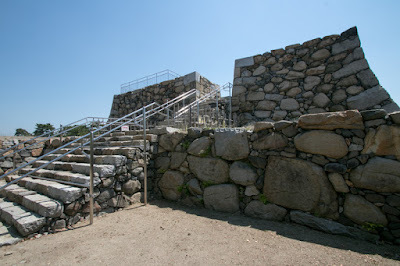 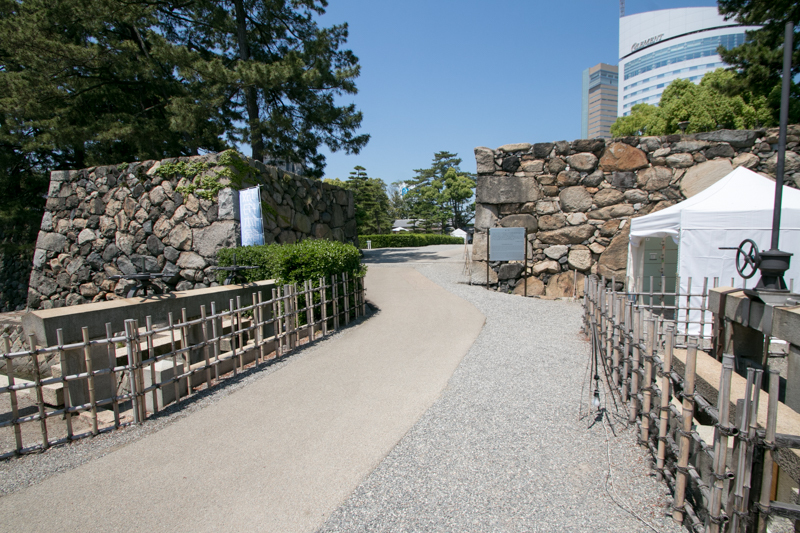 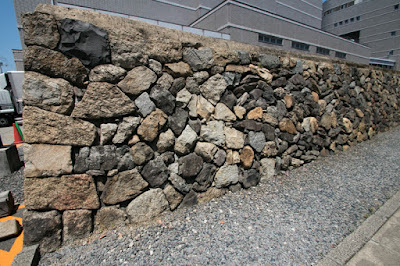 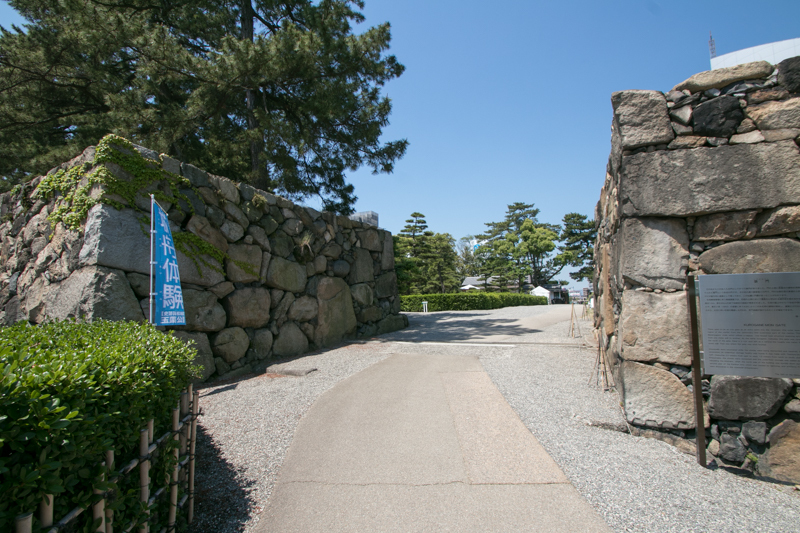 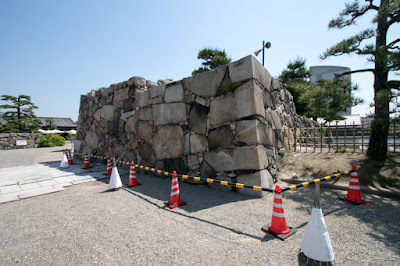 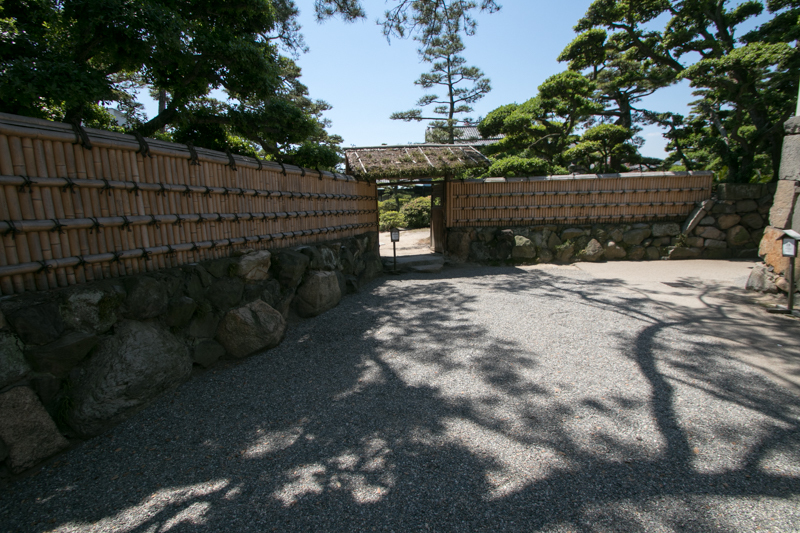 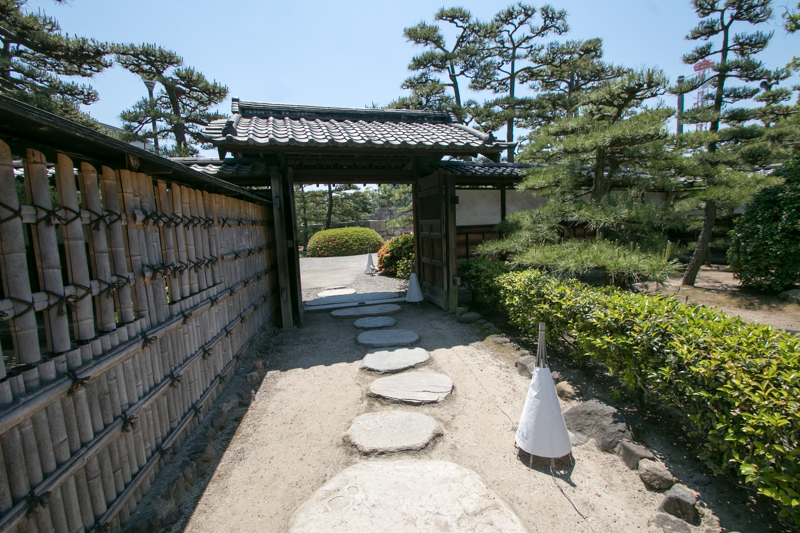 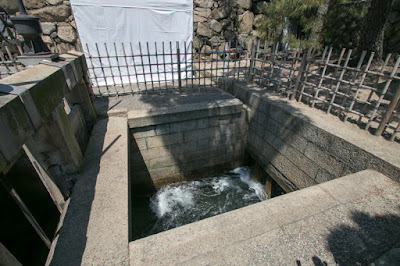 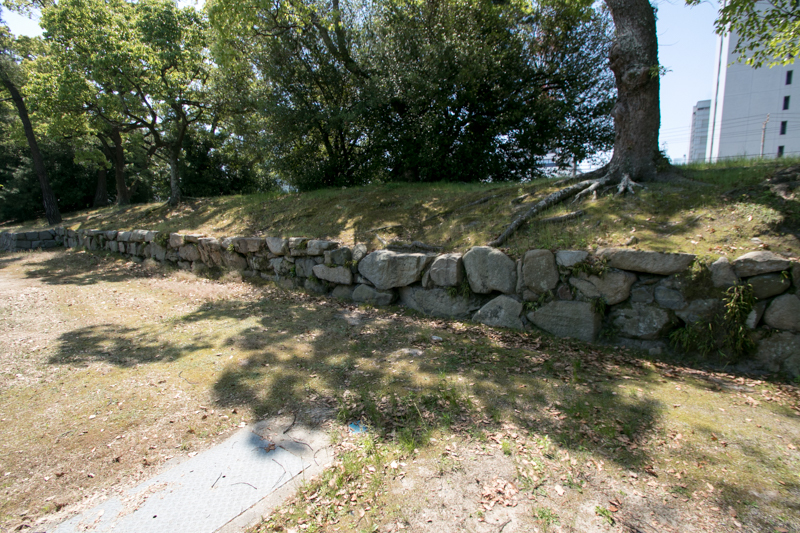 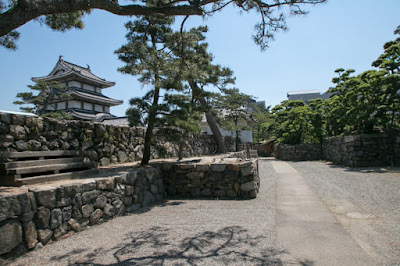 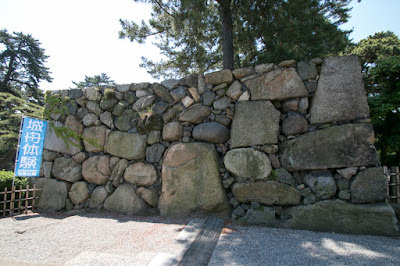 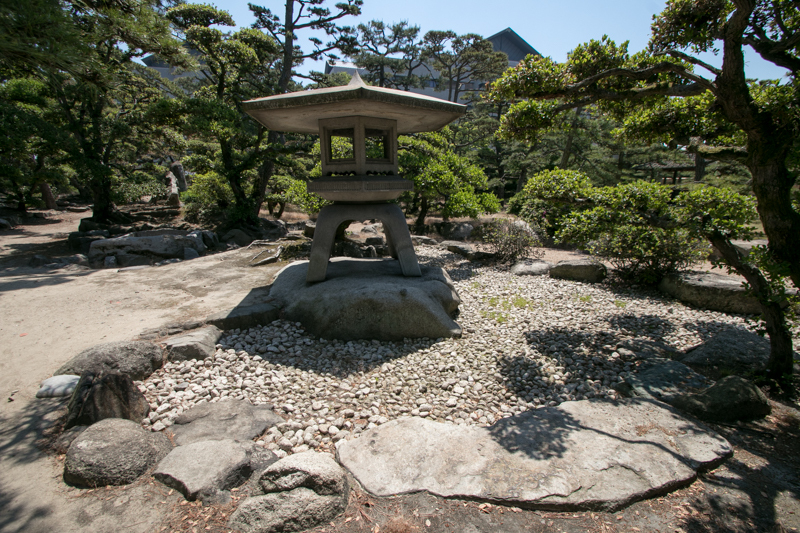 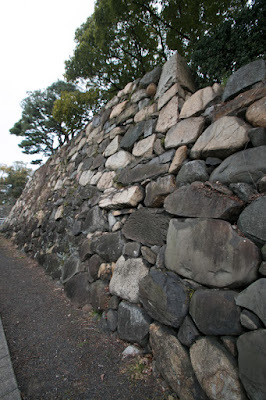 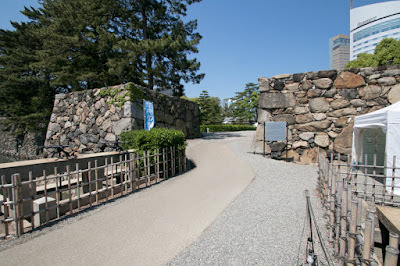 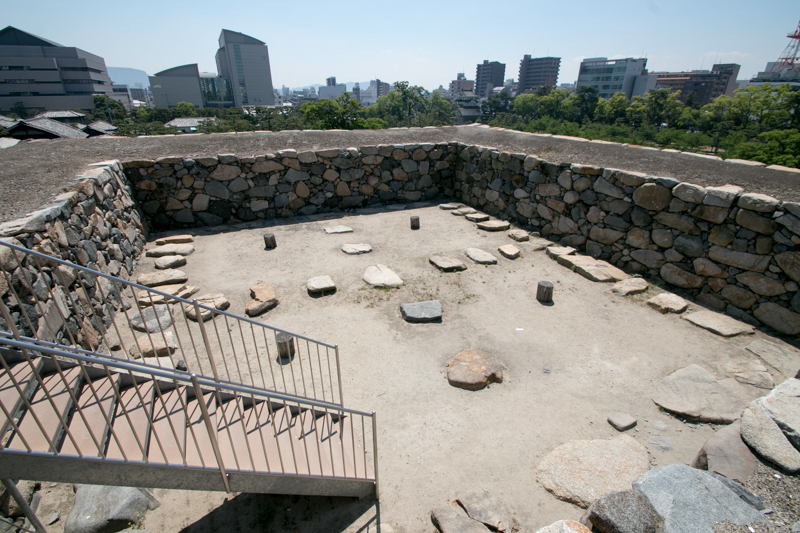 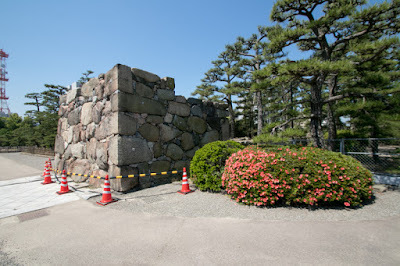 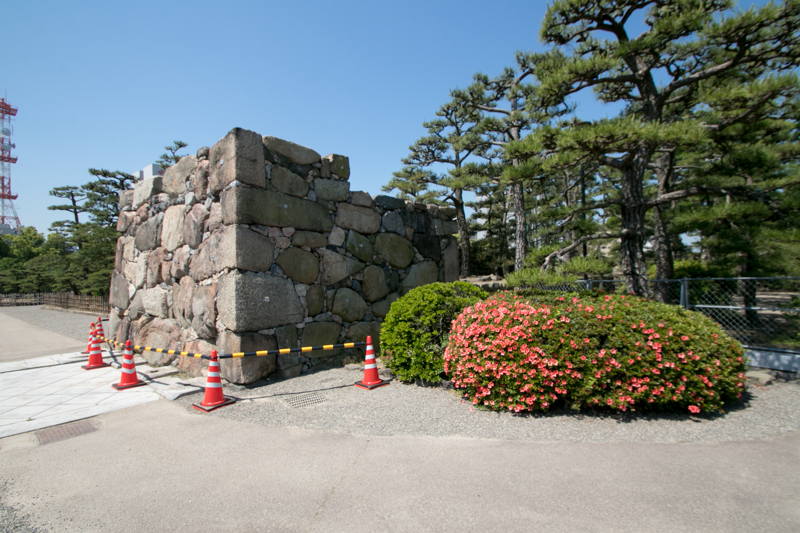 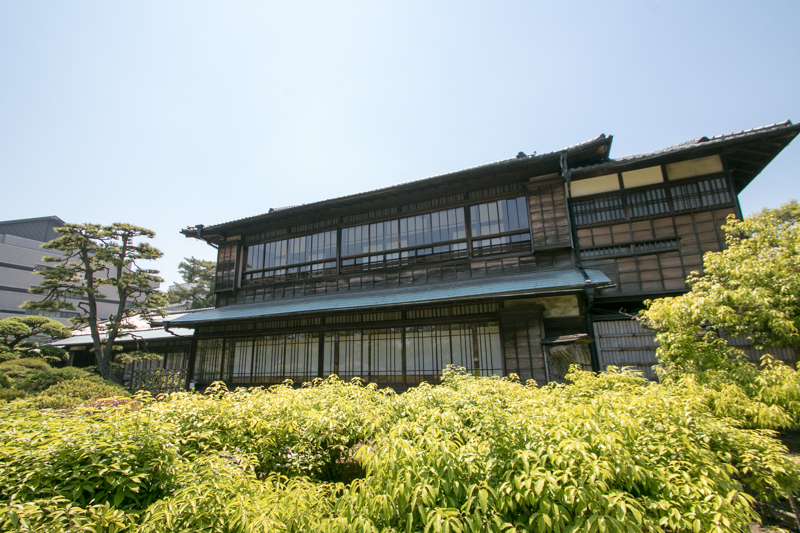 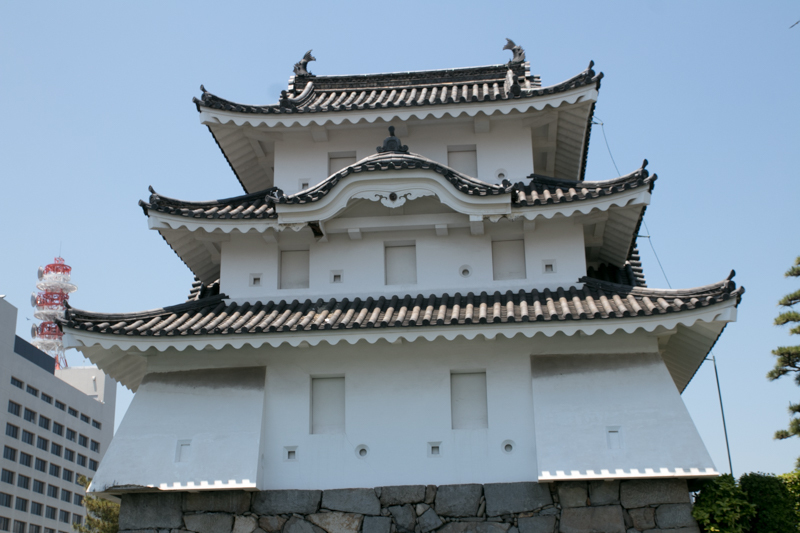 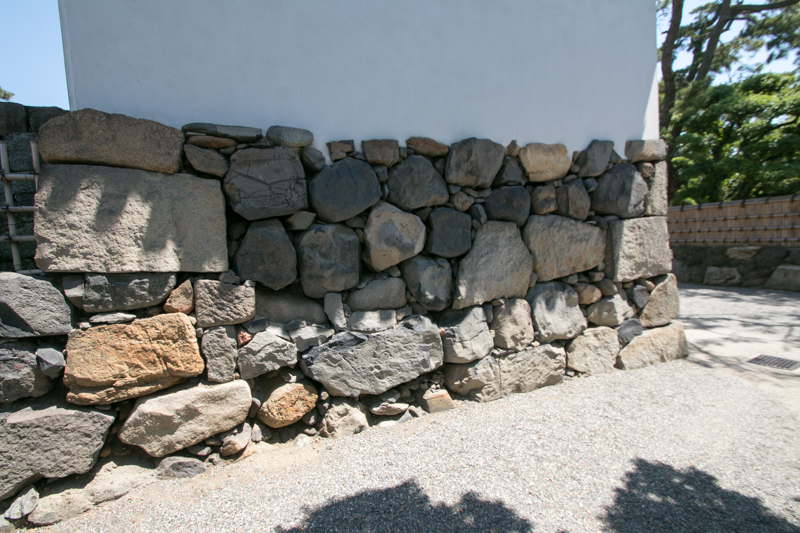 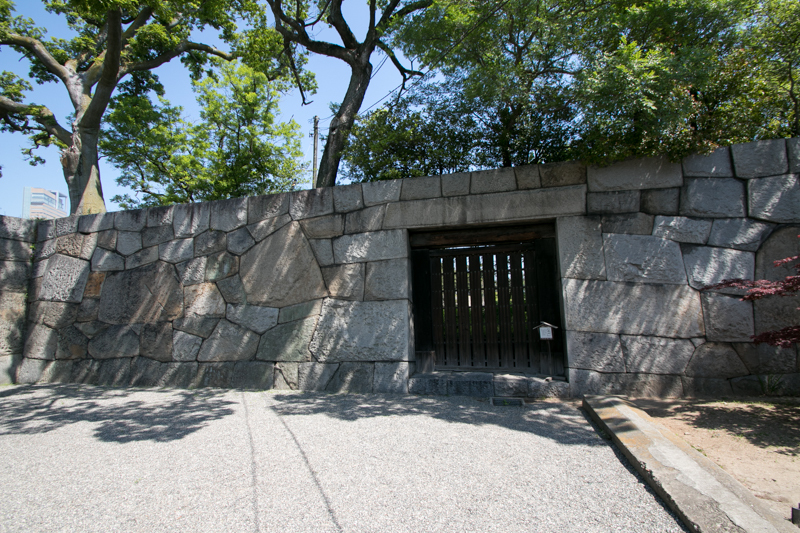 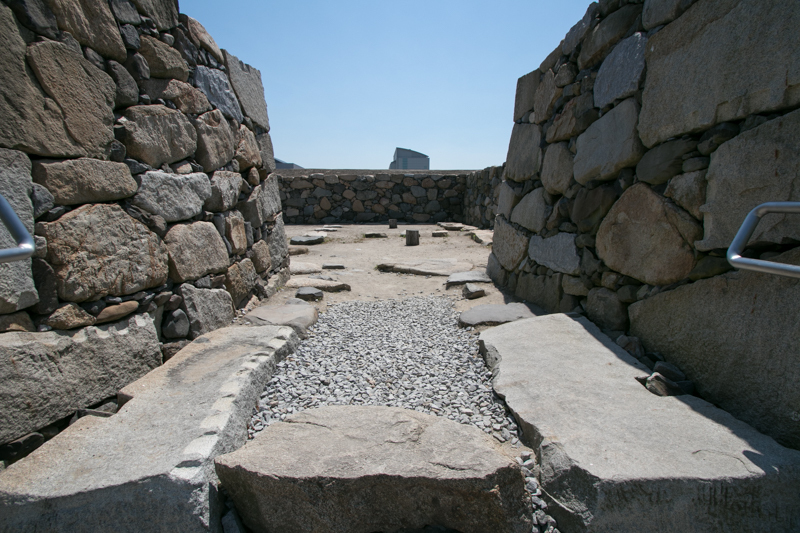 Mihara castle (Hiroshima prefecture) is also built for this purpose by Takakage Kobayakawa. Chikamsa Ikoma was appointed as the governor of whole Sanuki country in 1587. 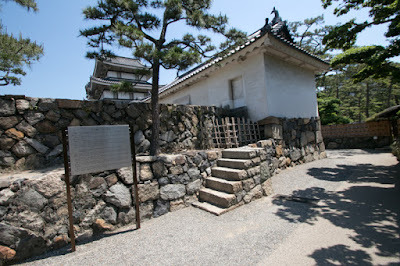 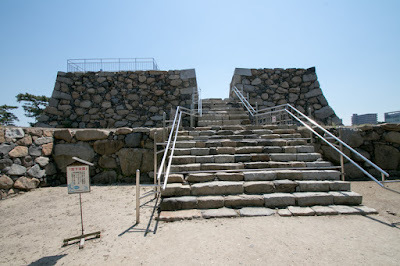 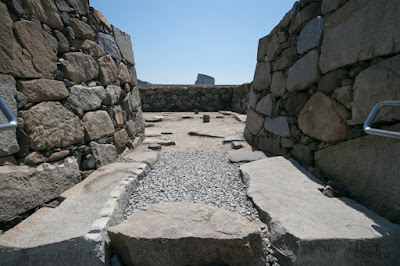 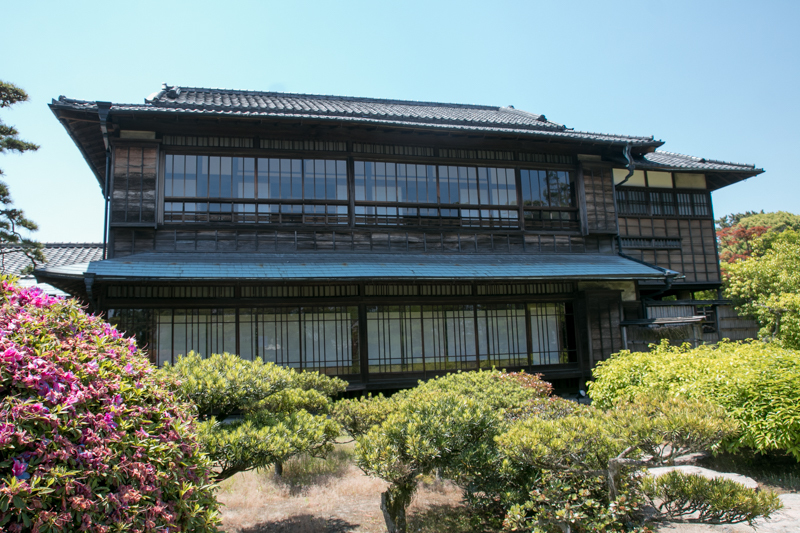 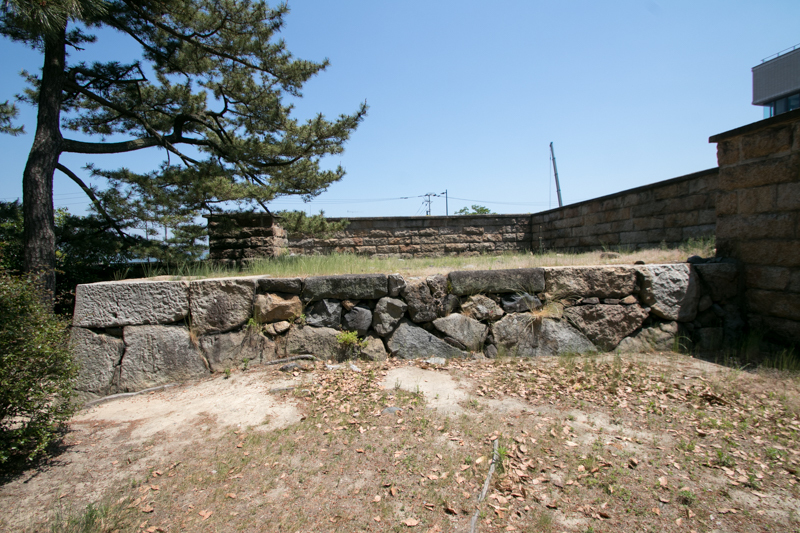 Chikamasa at first entered Hiketa castle (Kagawa prefecture), but this castle was located at the eastern border of Sanuki province and was not appropriate to manage the whole country. 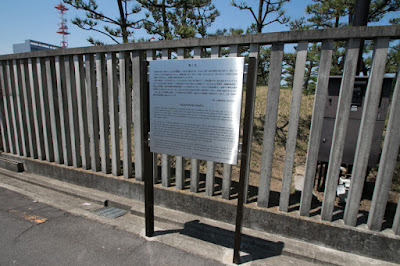 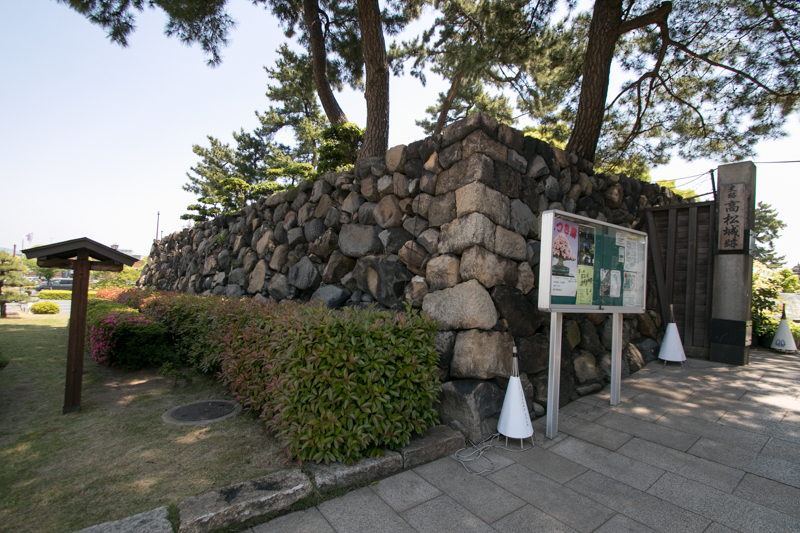 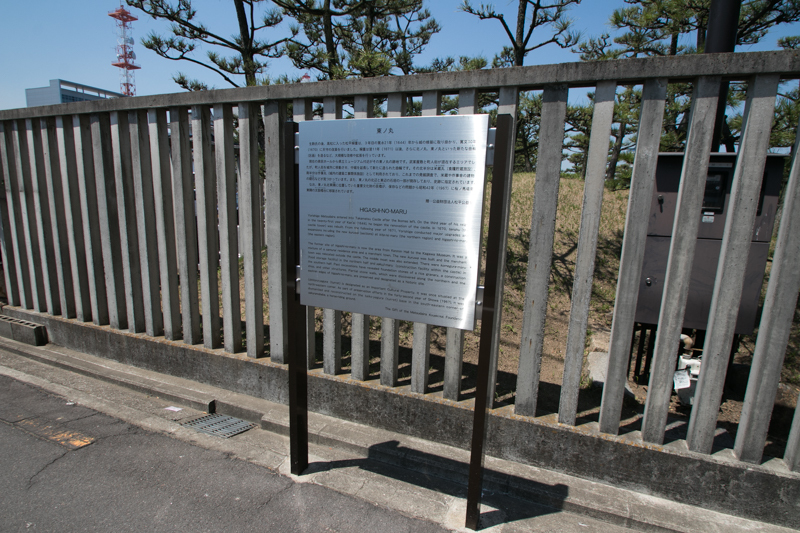 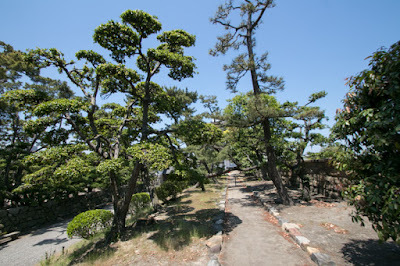 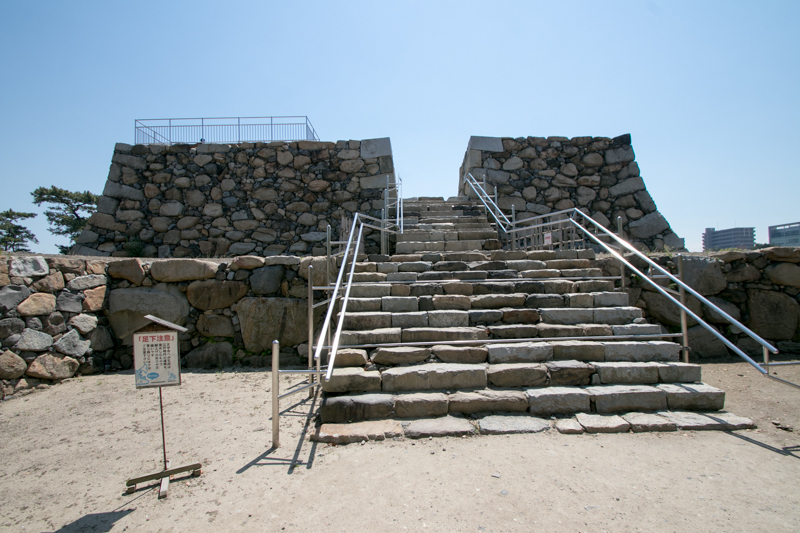 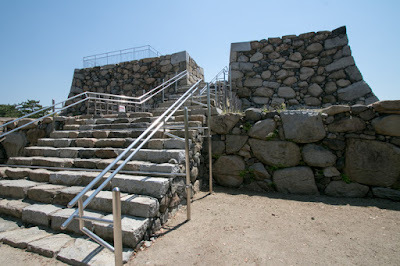 Thus from 1588 Chikamasa newly built a castle at the coast of current Takamatsu city. 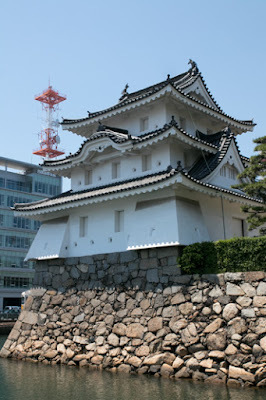 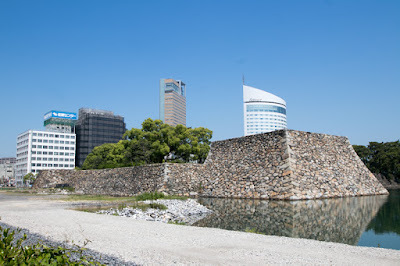 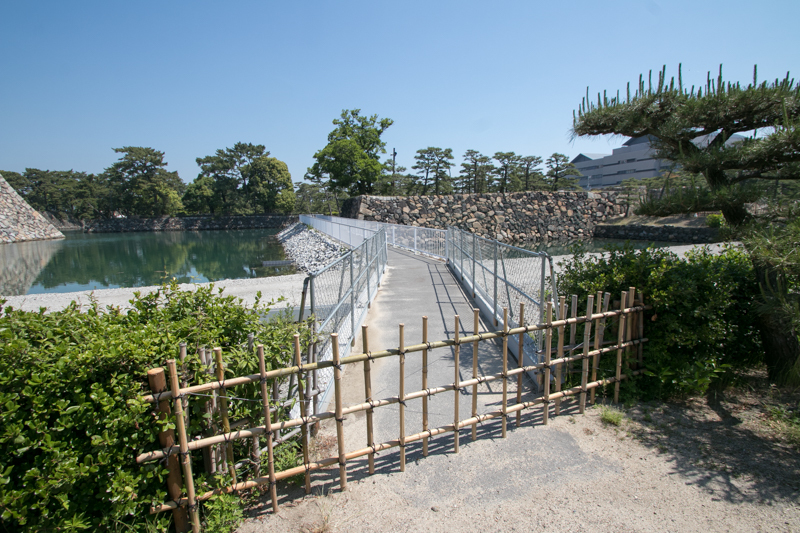 After two years construction Takamatsu castle was completed. 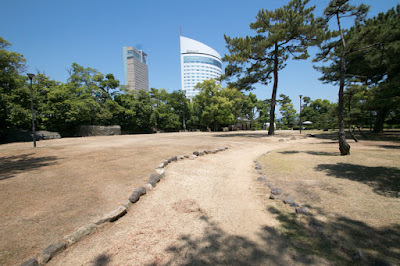 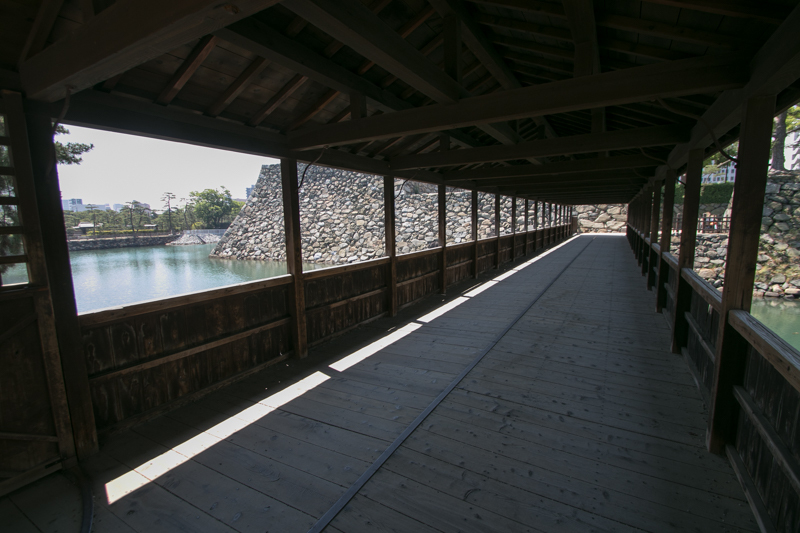 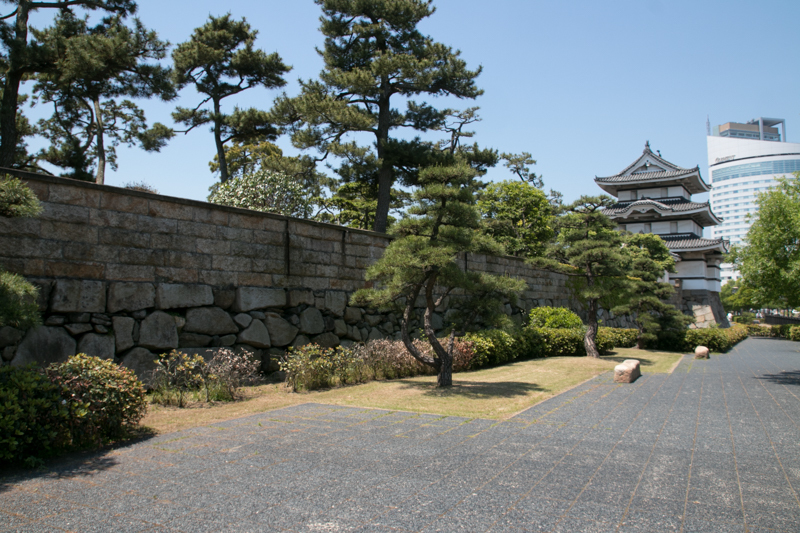 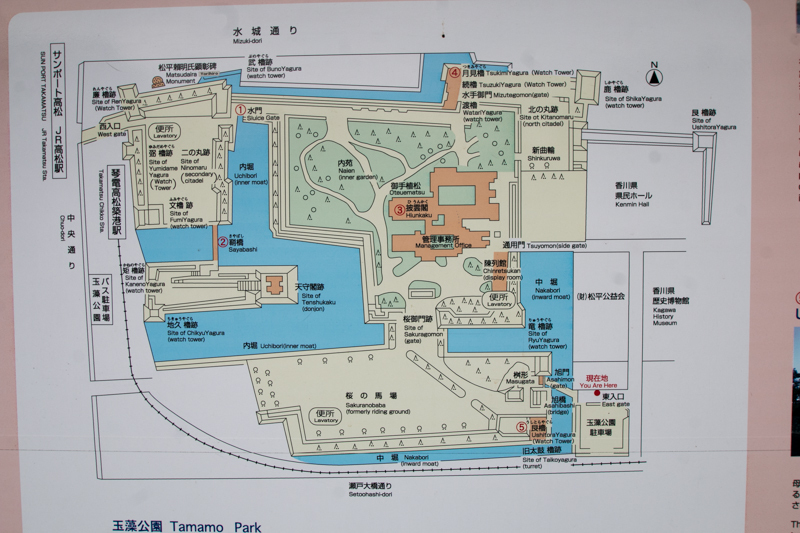 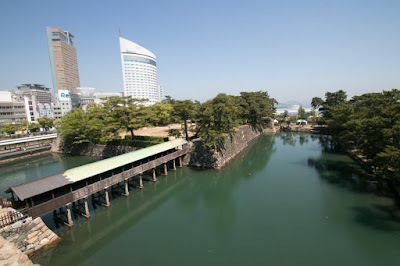 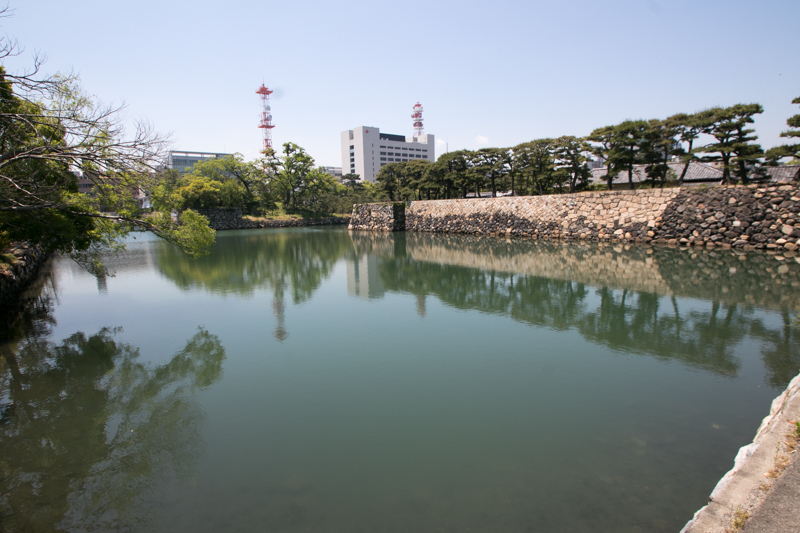 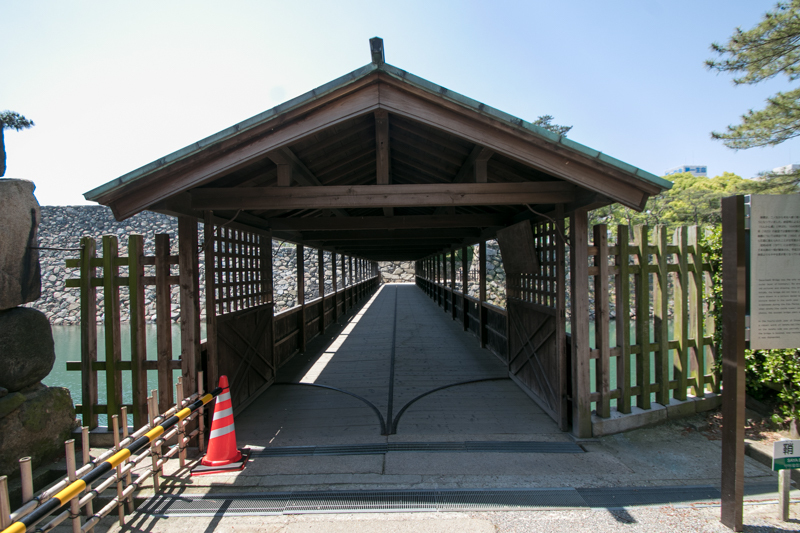 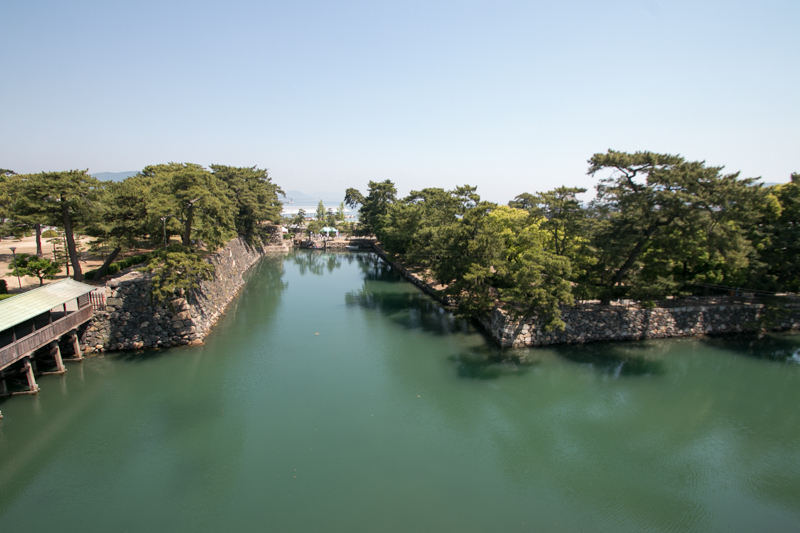 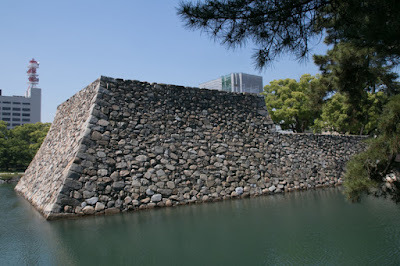 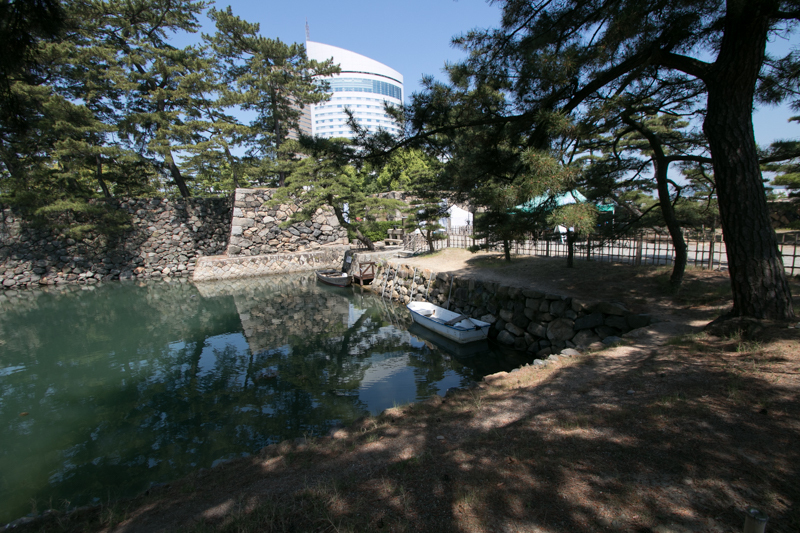 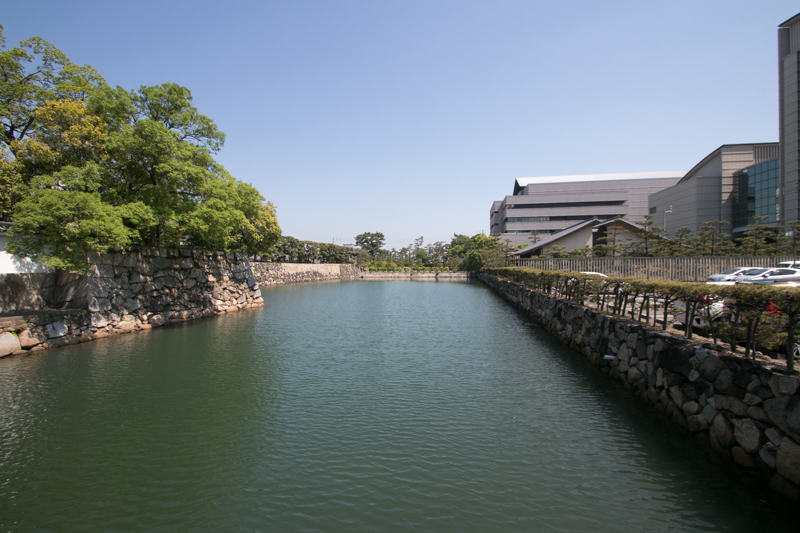 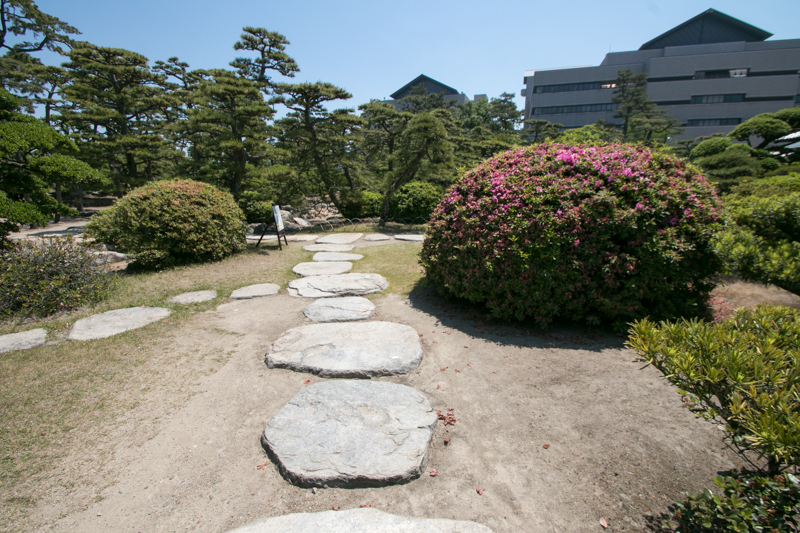 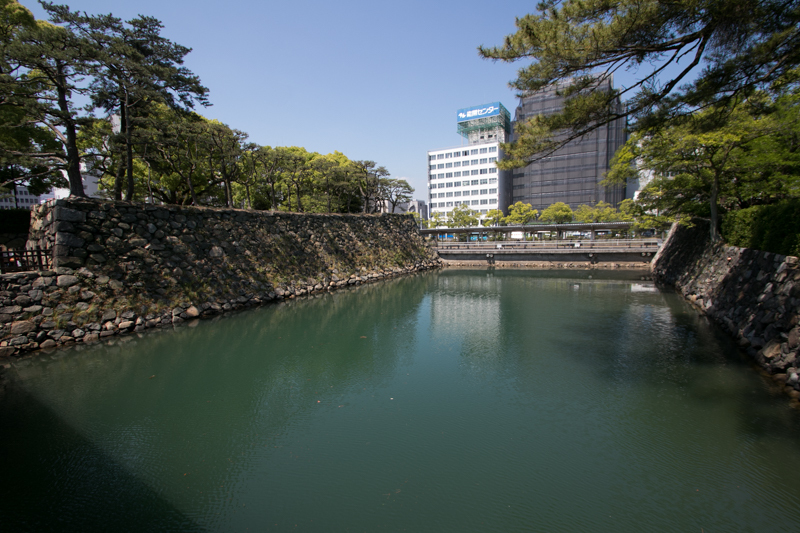 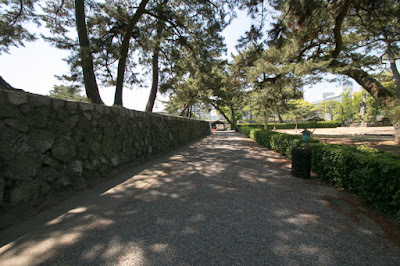 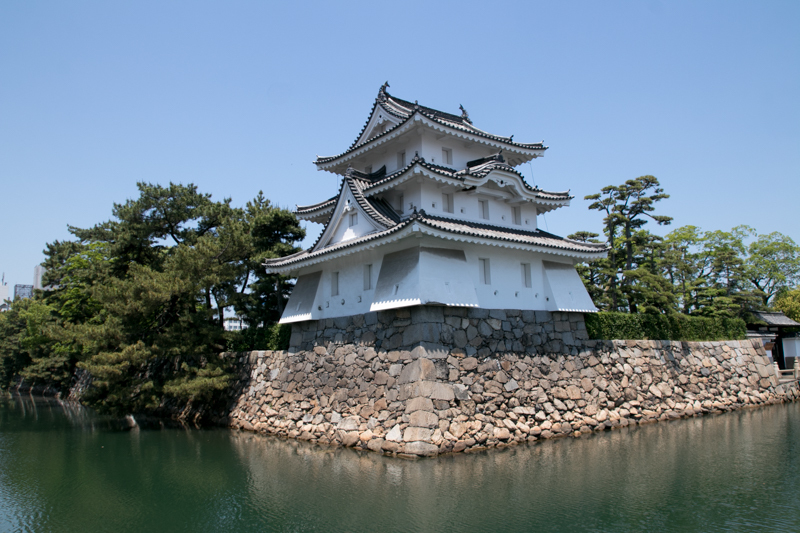 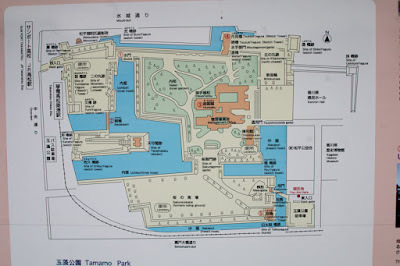 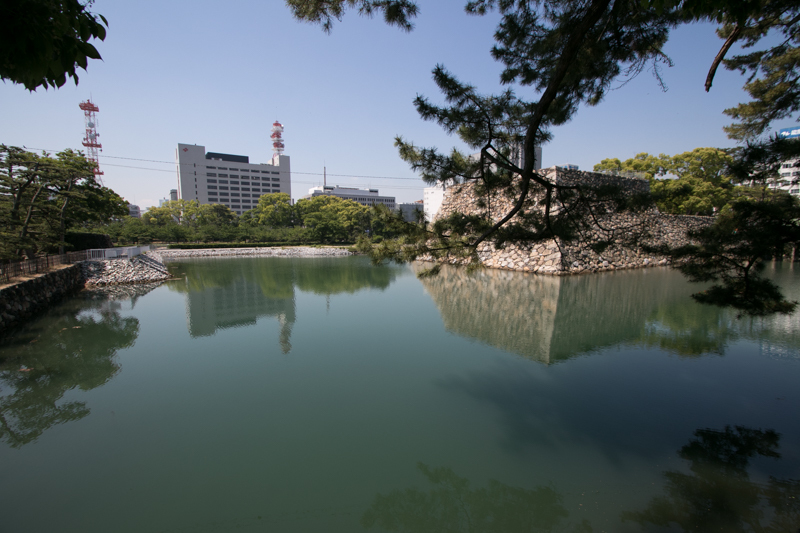 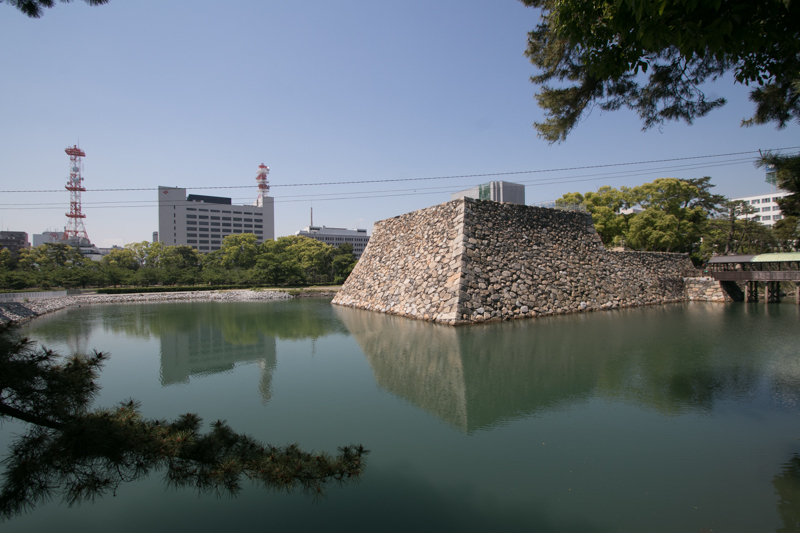 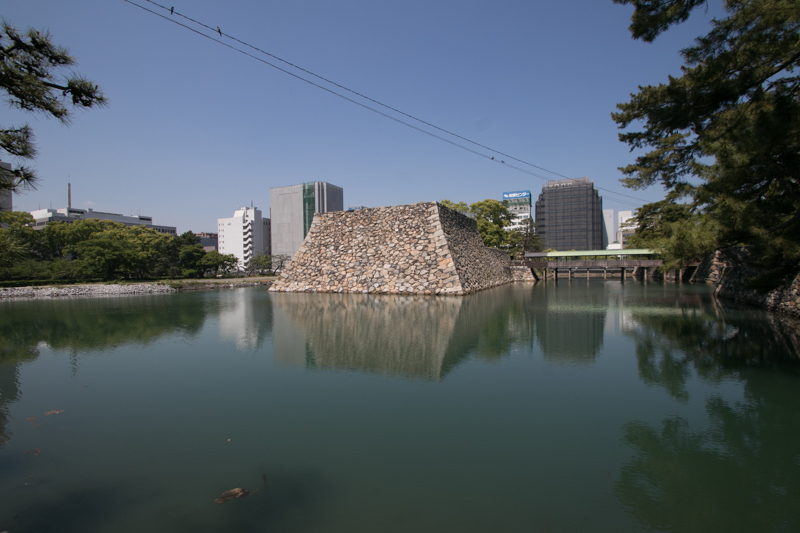 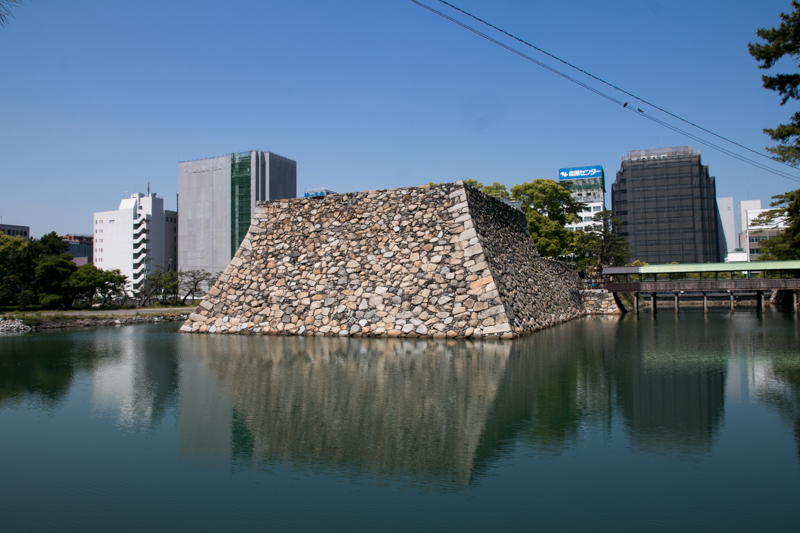 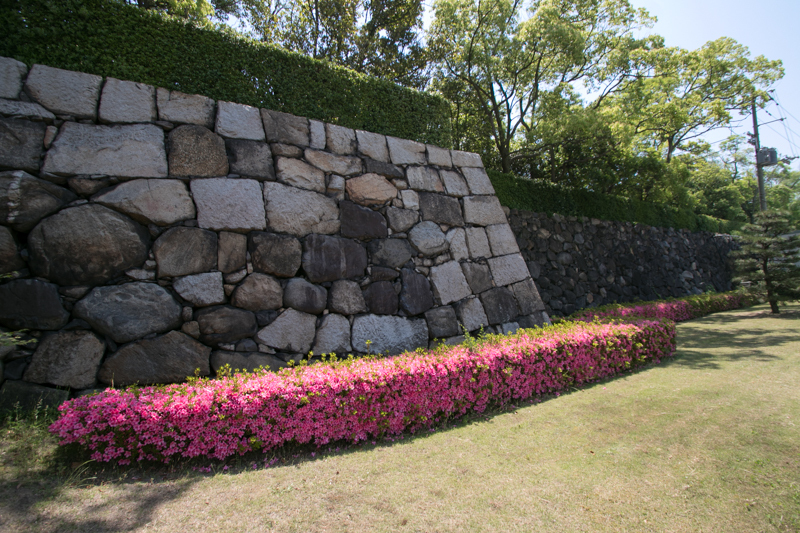 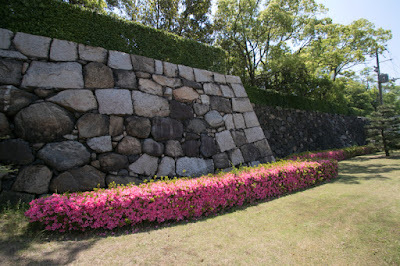 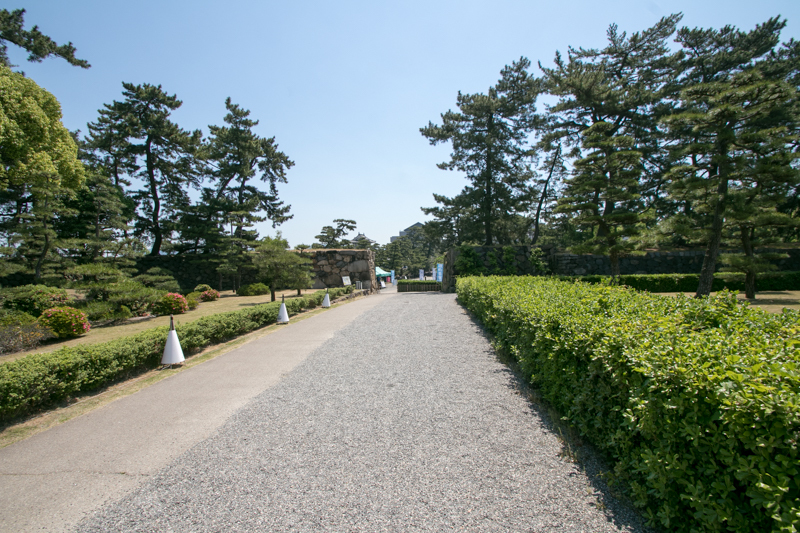 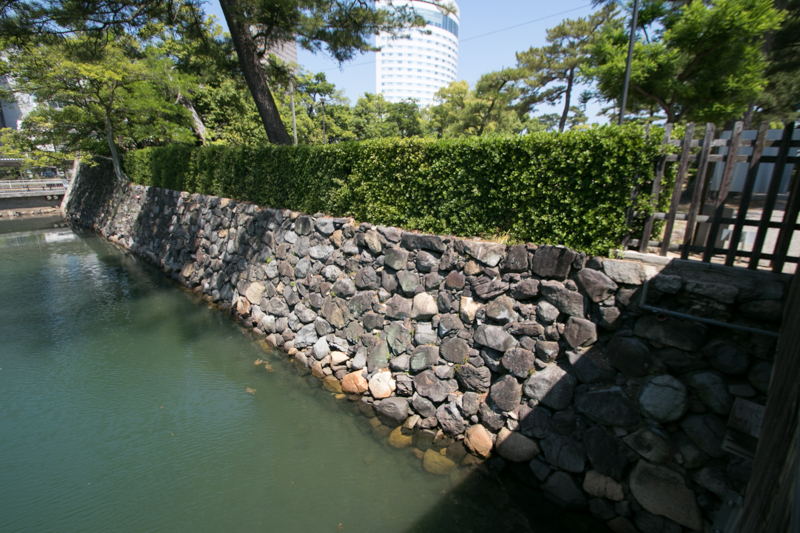 The shape of Takamatsu castle is a rectangular of 400 meter length and 200 meter width. The central area is a small compartment of 50 meter length and 20 meter width, and connected to secondary area only by bridge. 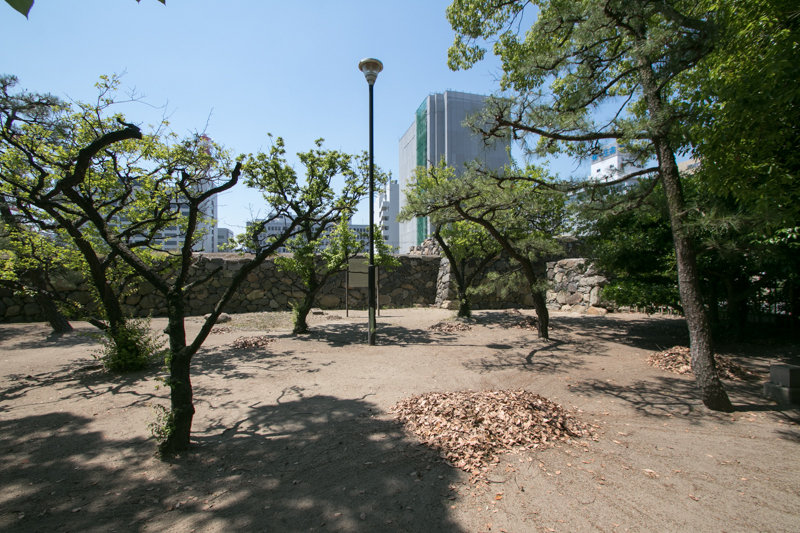 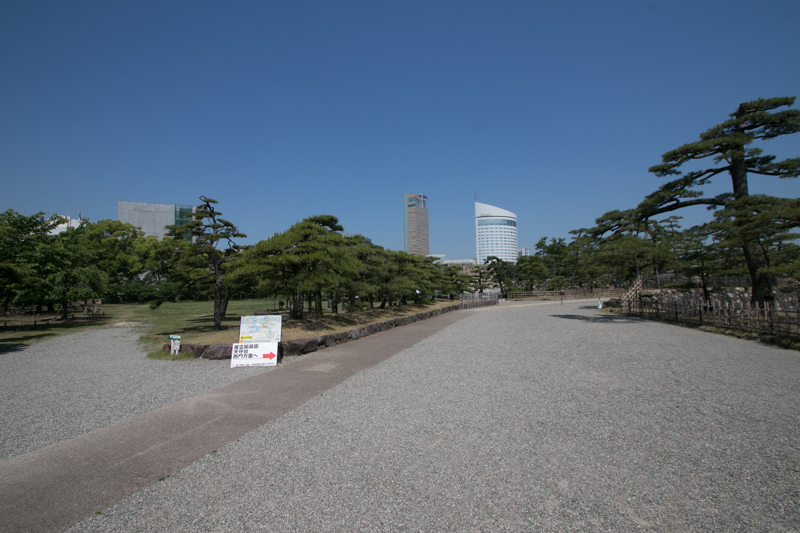 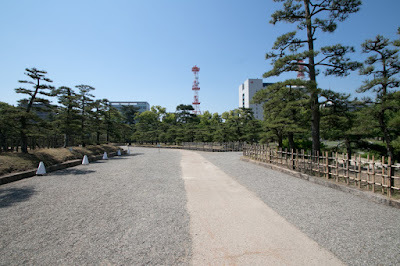 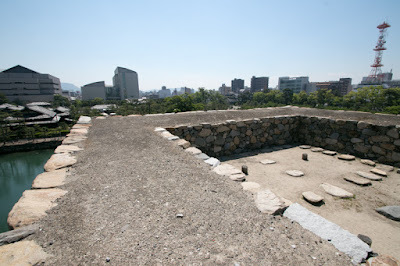 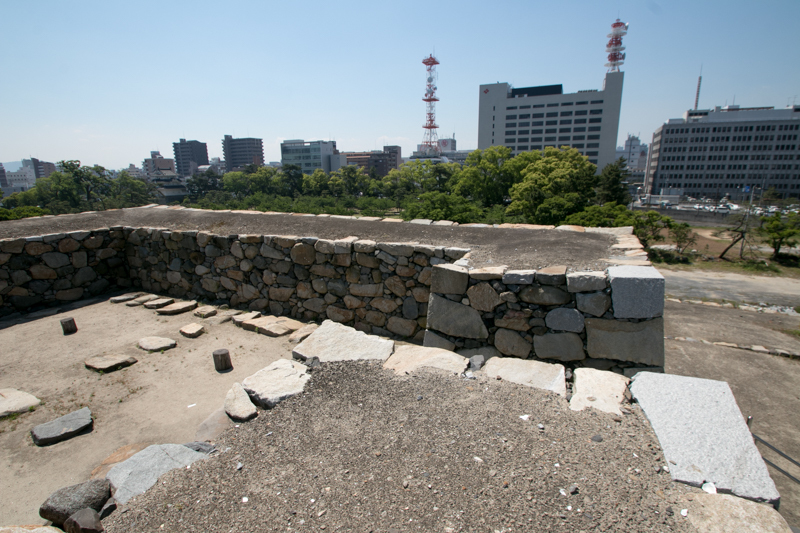 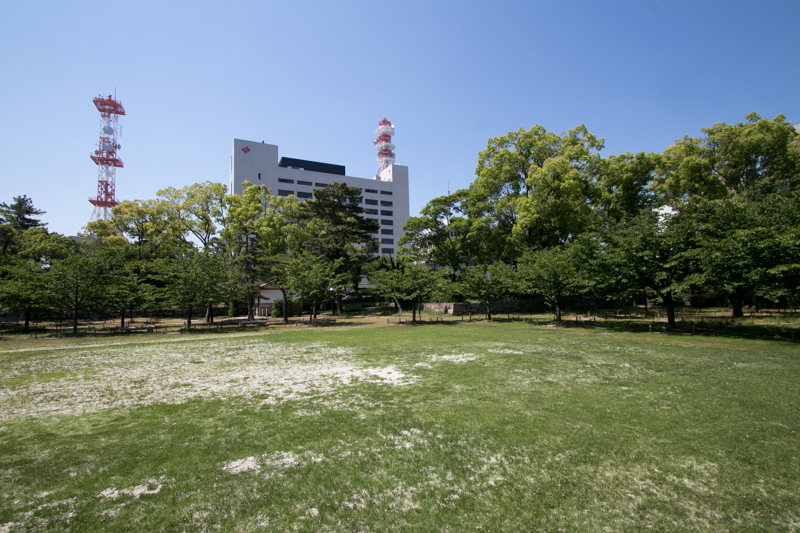 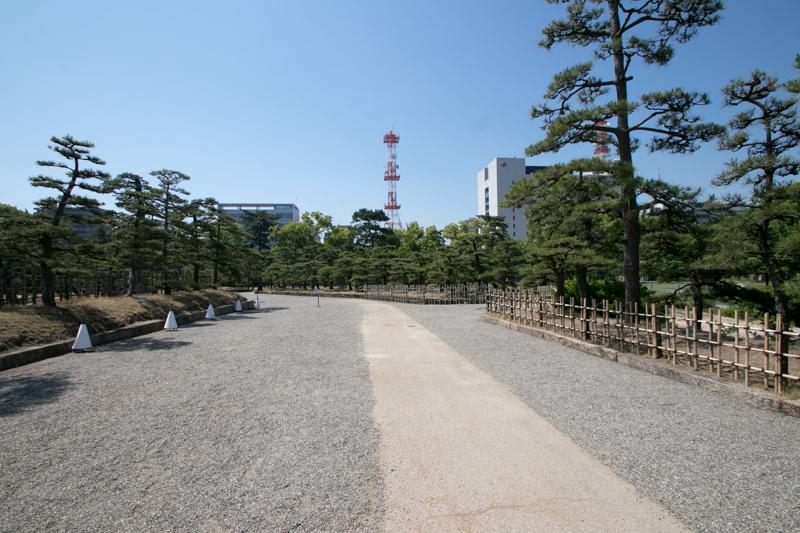 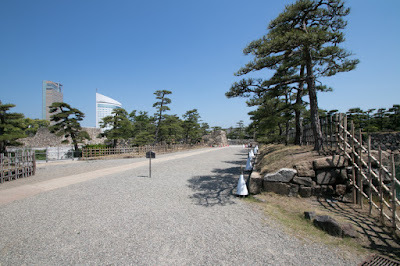 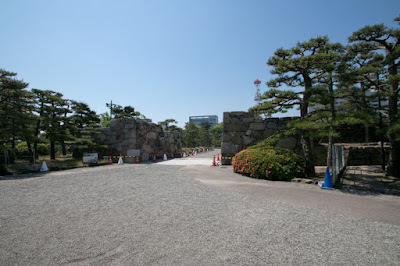 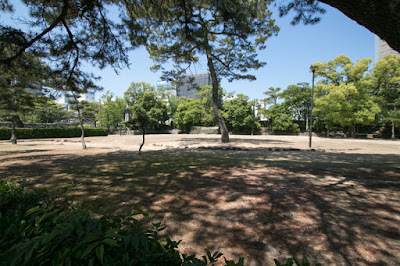 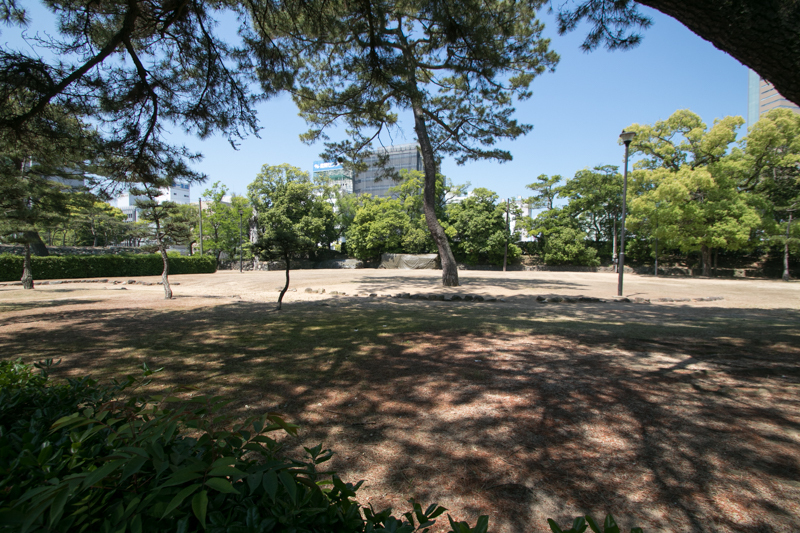 At the east edge of central area there stood three story main tower. 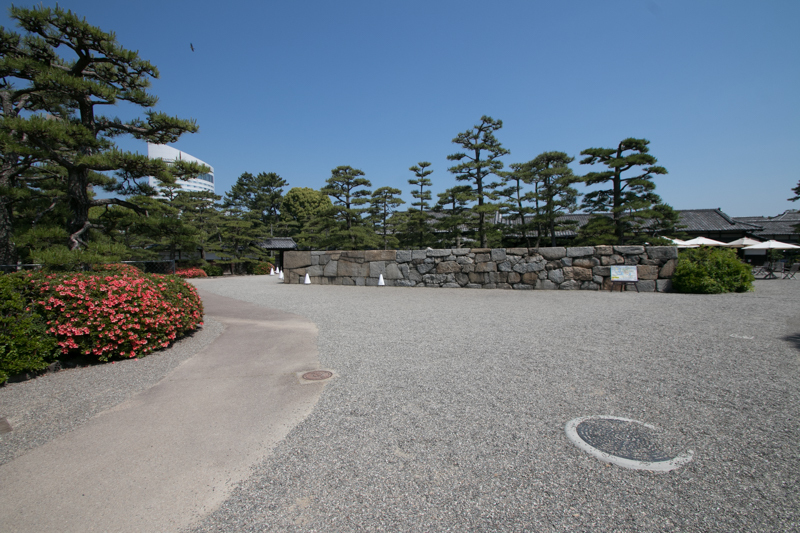 Outside of the central area. 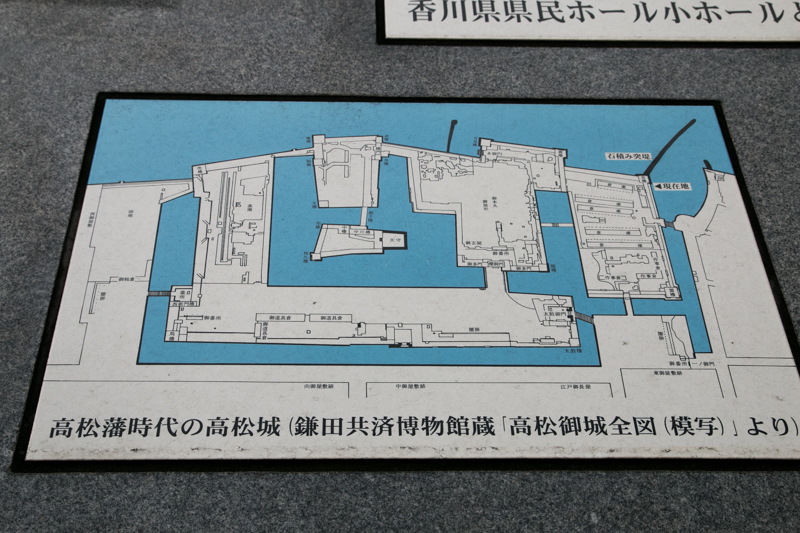 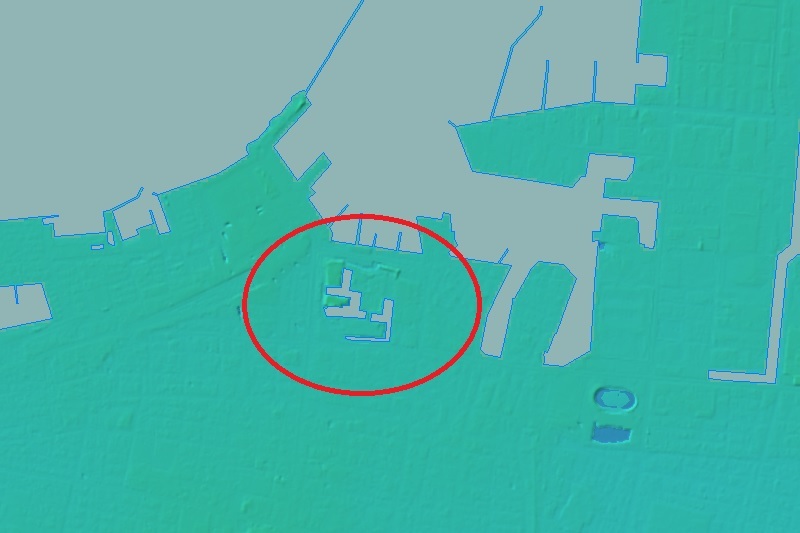 secondary area, third area, Sakuranobaba area and Nishinomaru area surrounded the central area in clockwise. 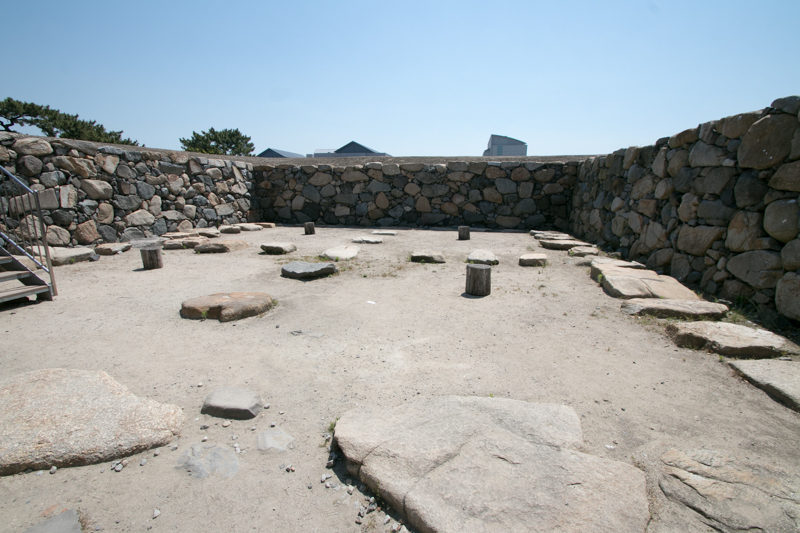 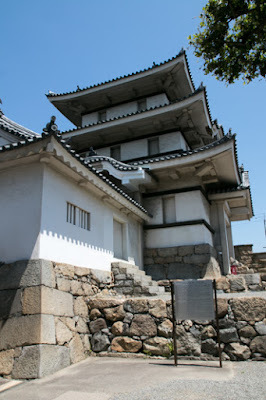 Ikoma clan at first lived at Takamatsu castle, but Takamatsu castle located at a flat place and not so large, thus later built Marugame castle and moved there. 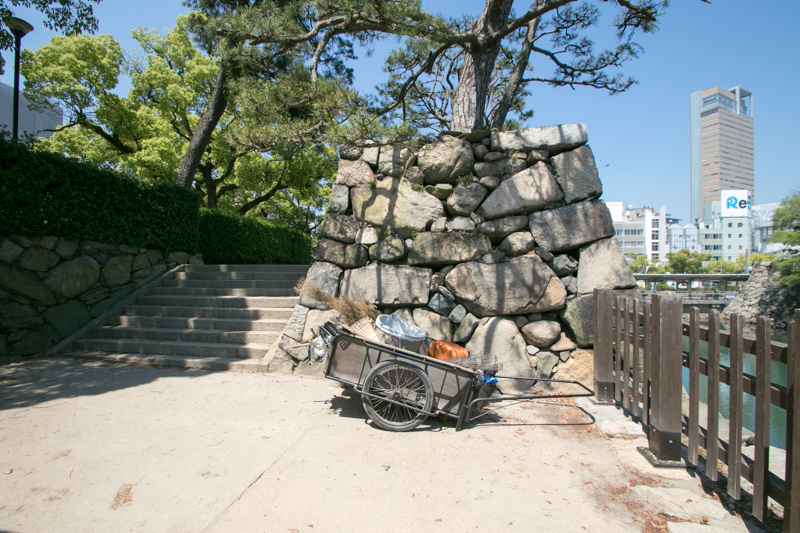 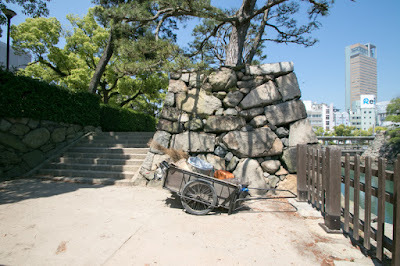 But after the battle of Sekigahara in 1600, leader of the clan returned to Takamatsu castle again. 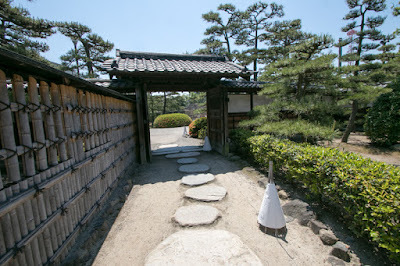 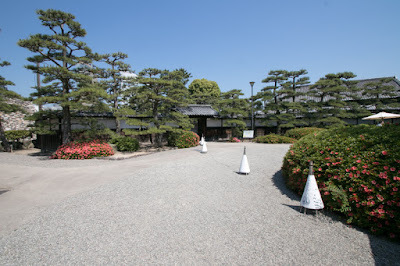 In 1640, due to the internal conflict Ikoma clan was confiscated its territory, and in 1642 Matsudaira clan was transferred from Shimodate castle (Ibaraki prefecture) to Takamatsu castle. Matsudaira clan reformed Takamatsu castle and built new buildings including a five story main tower built by Nanban style (a style that top floor is larger than below floor, like the tower of western castle). 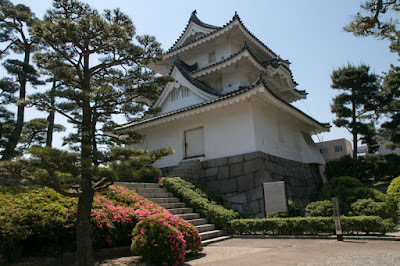 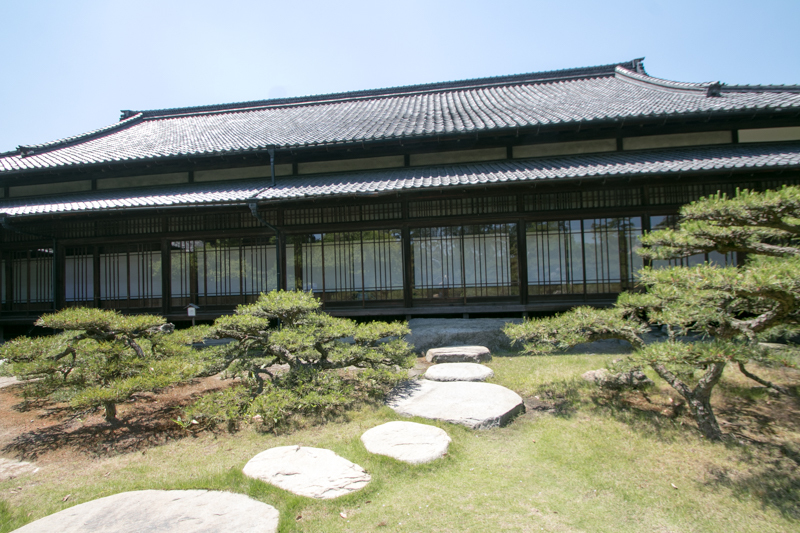 Matsudaira clan managed Takamatsu castle by the end of Edo era. 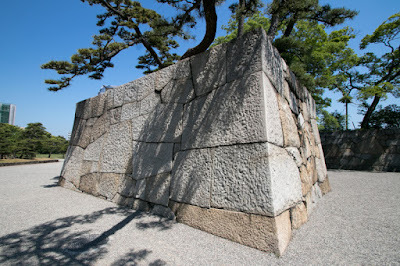 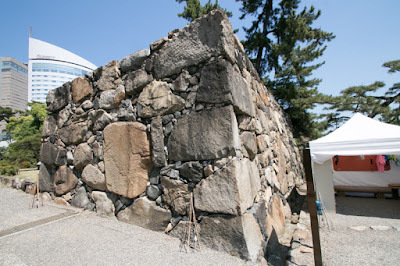 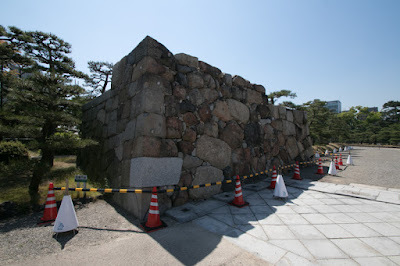 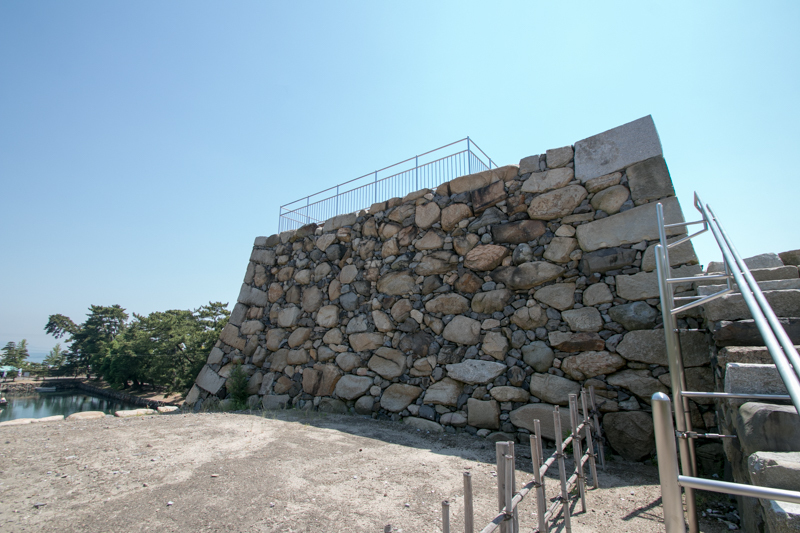 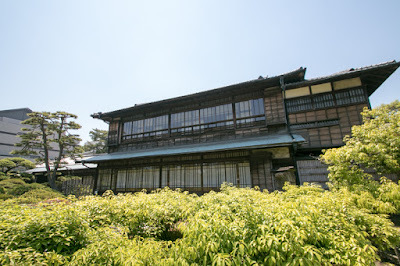 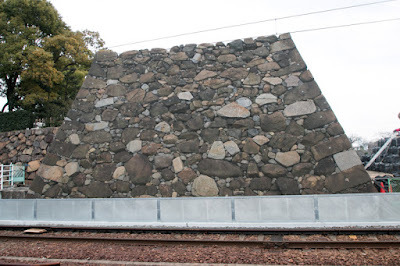 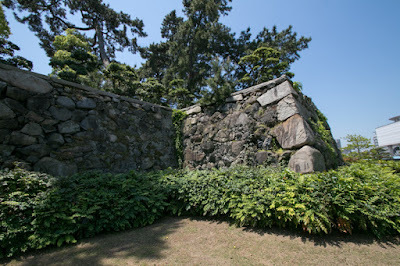 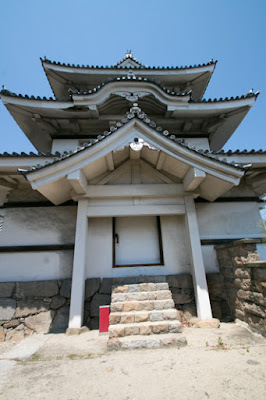 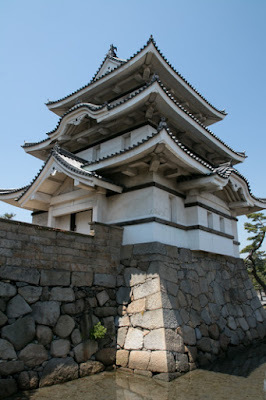 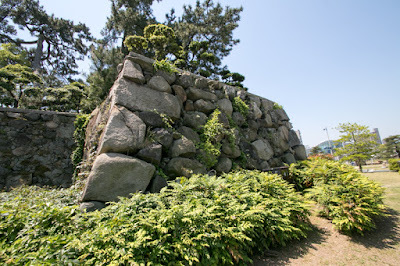 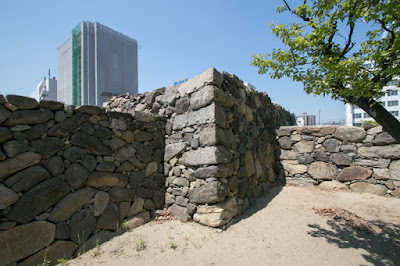 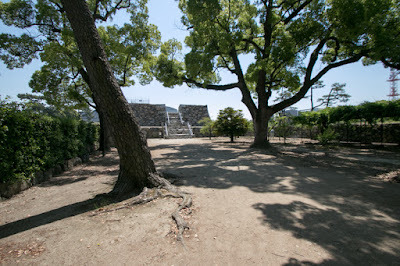 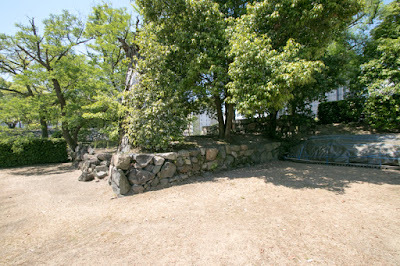 Subsequent to Meiji revolution many buildings including main tower were lost, but Tsukimi turret with connecting corridor and gate, an sophisticated three story turret at the north edge of the castle, and Ushitora turret, another three story turret with simple exterior still remain as original. 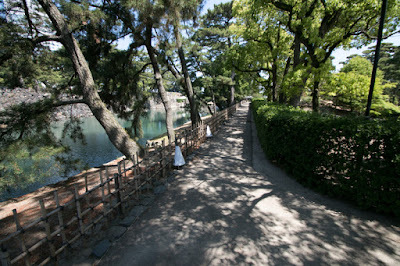 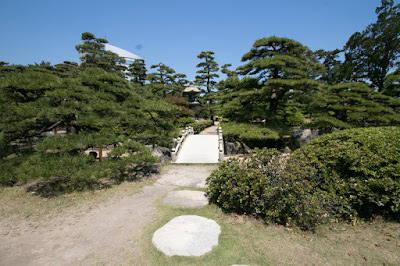 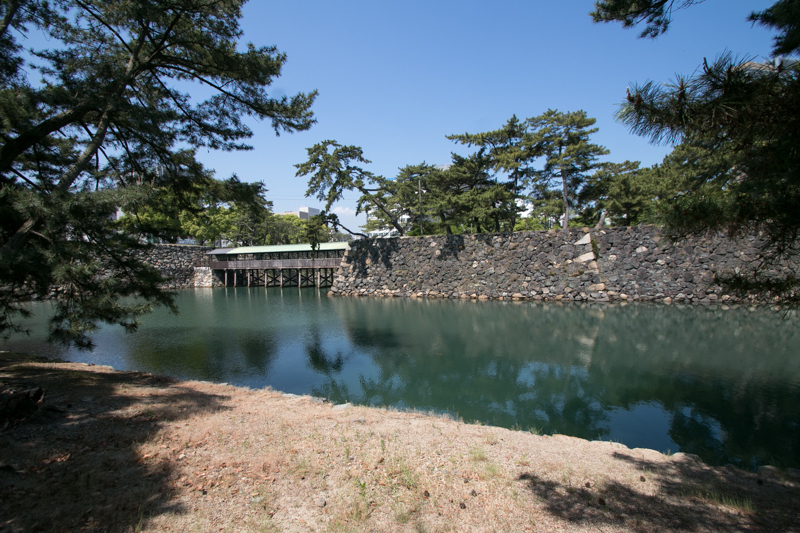 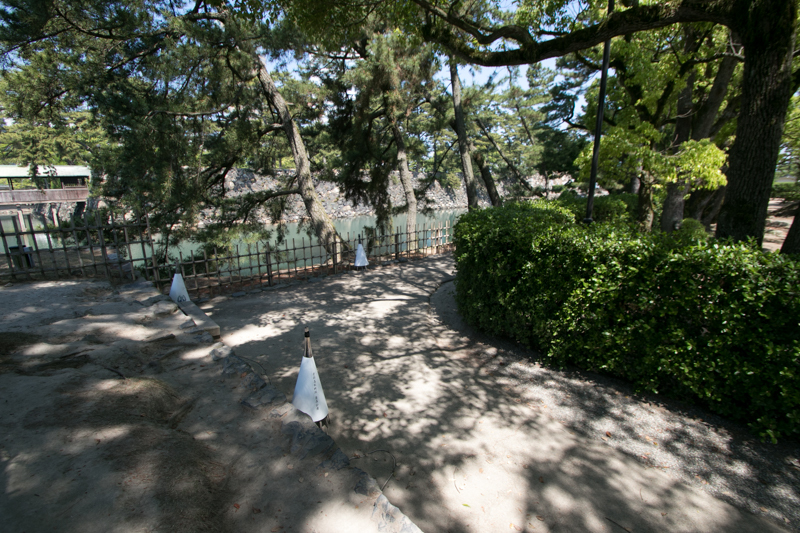 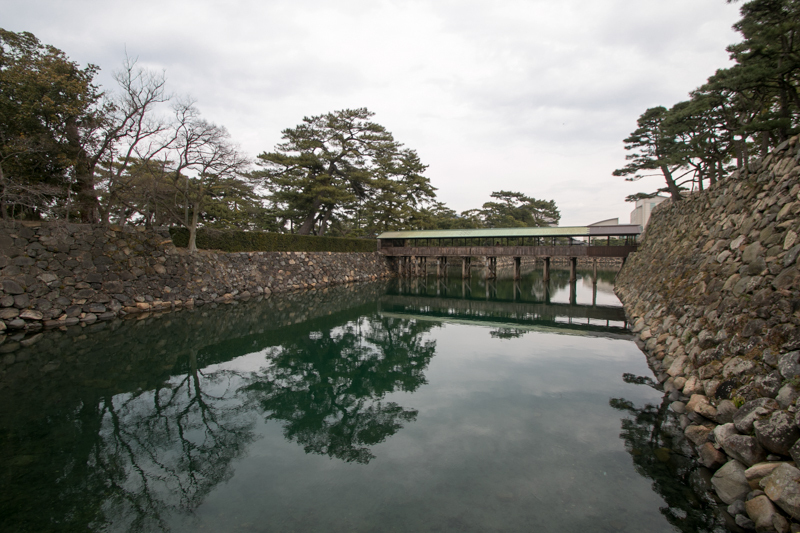 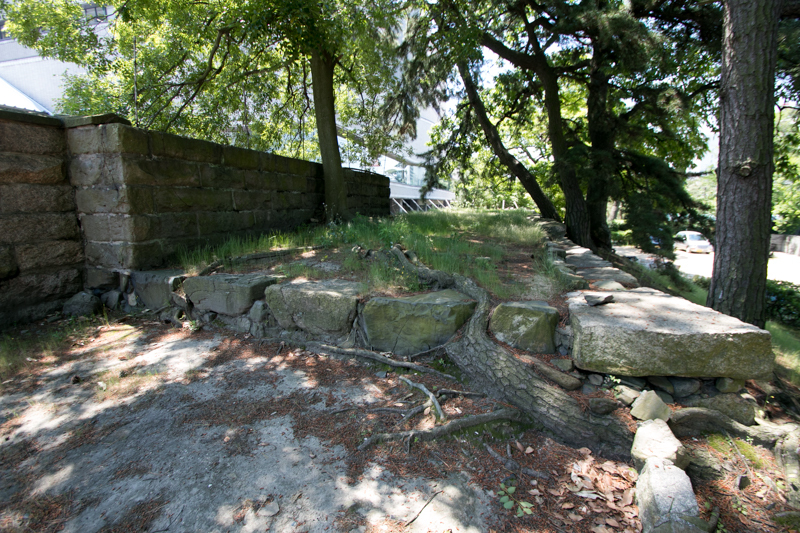 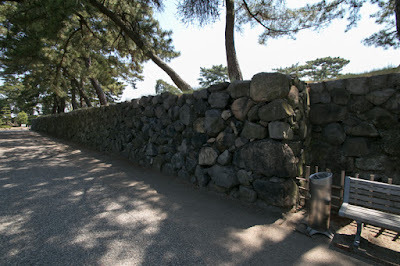 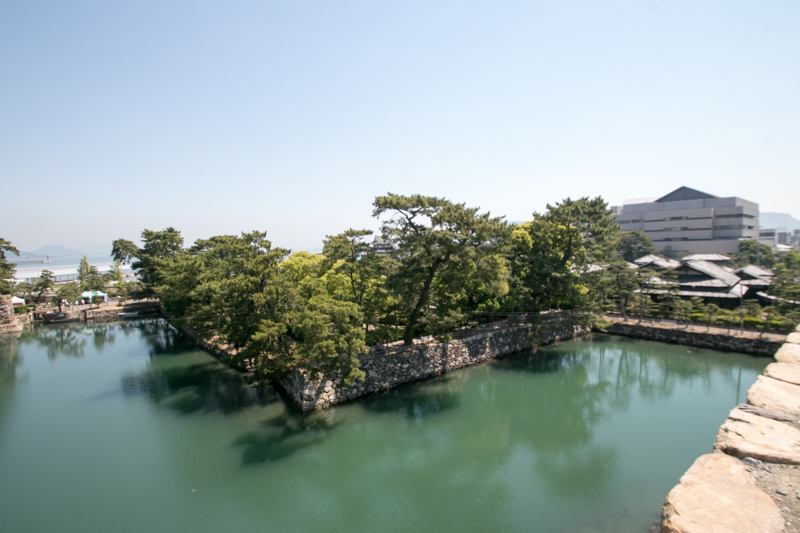 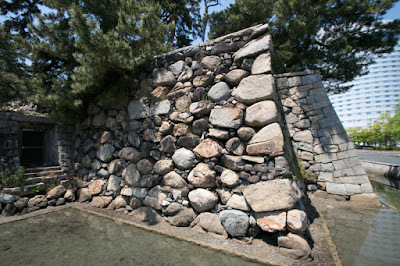 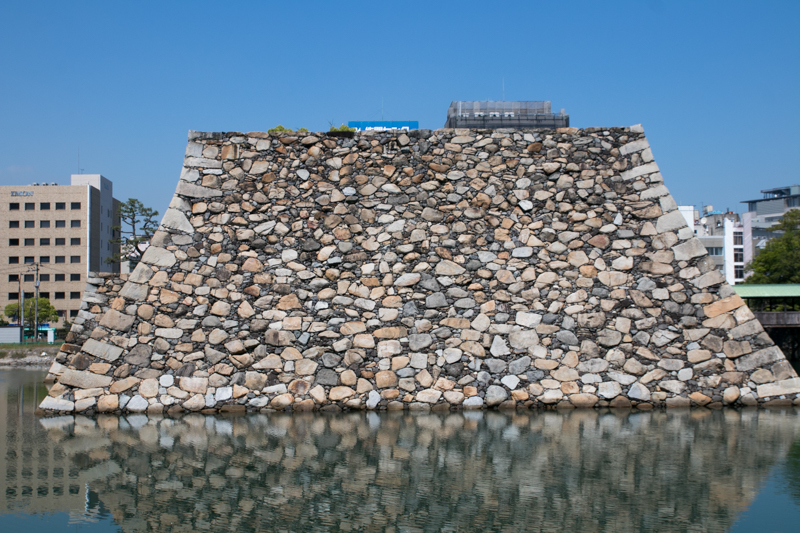 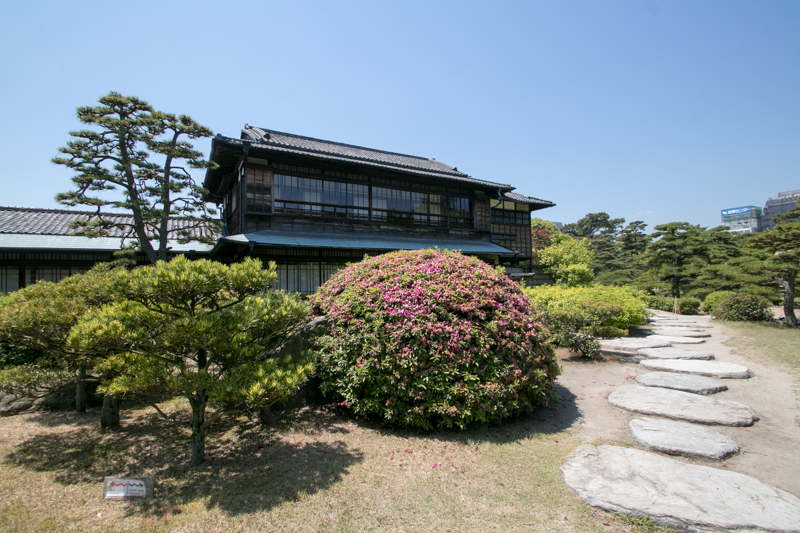 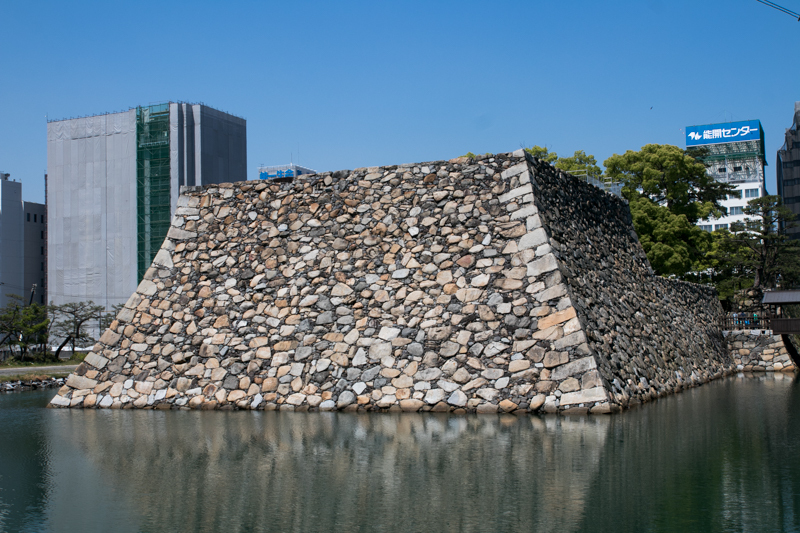 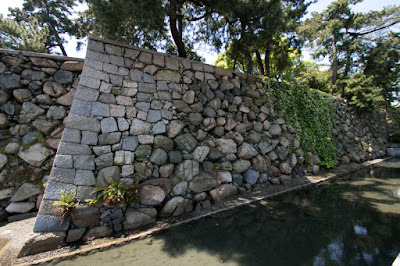 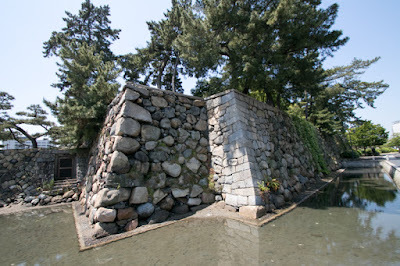 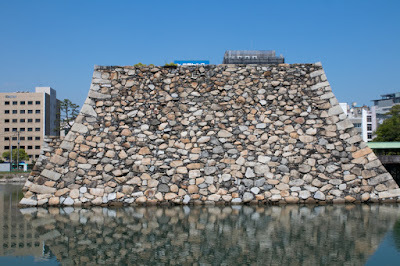 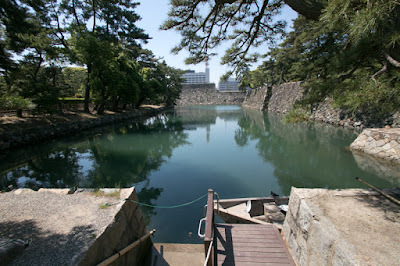 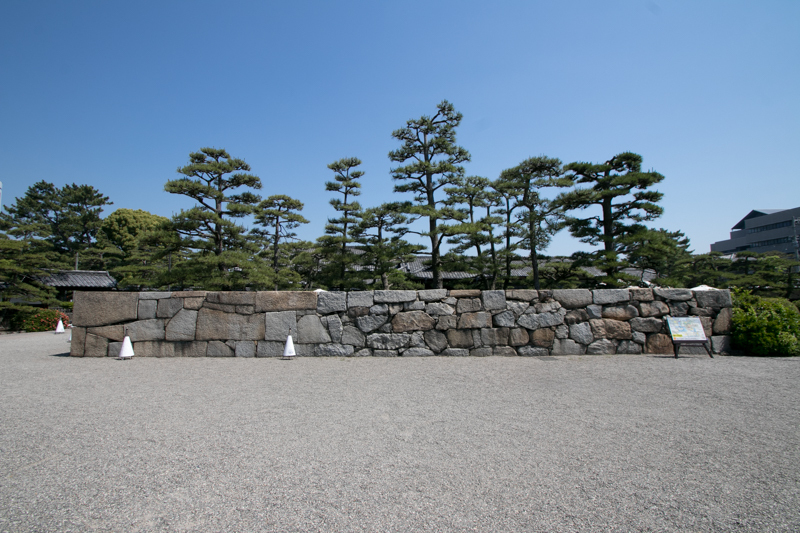 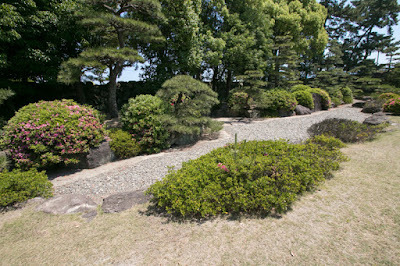 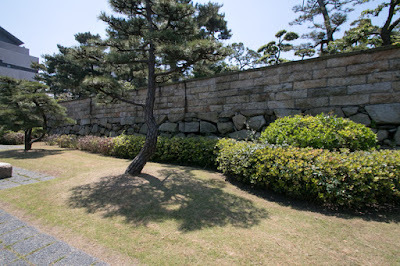 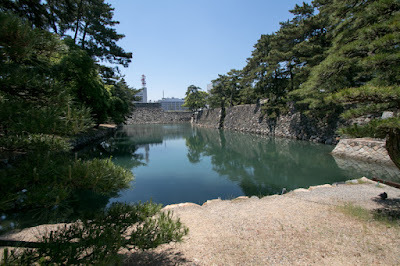 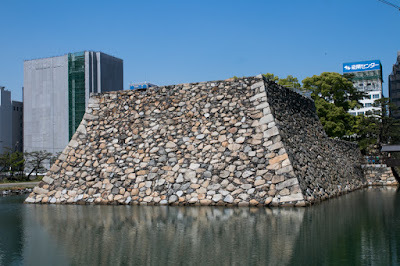 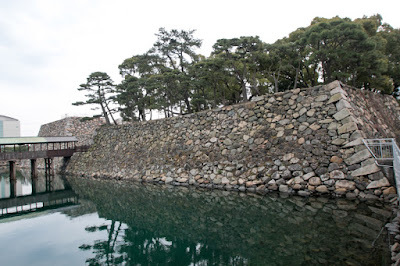 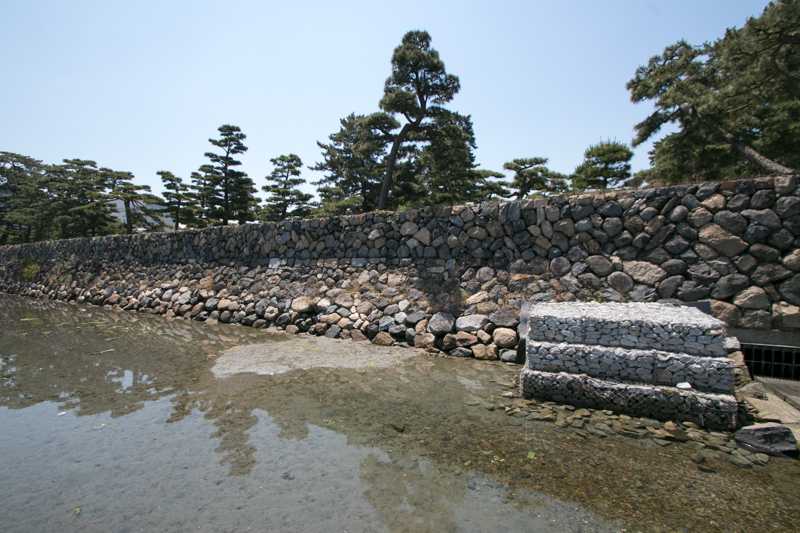 Combination of white walls of the turret, stone walls and pine trees above the water is a beautiful Oriental scenery. 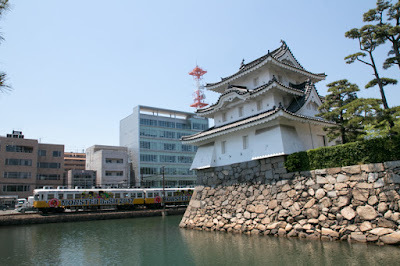 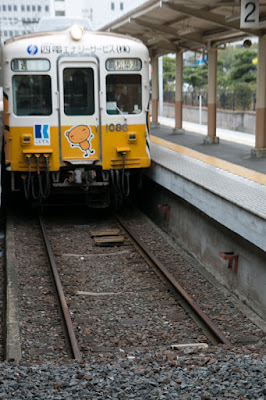 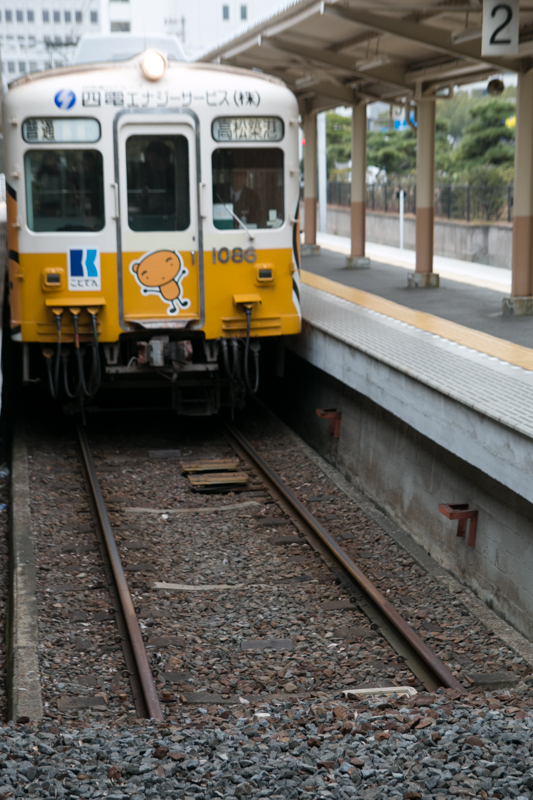 10 minutes walk from JR Shikoku Yosan line Takamatsu station. 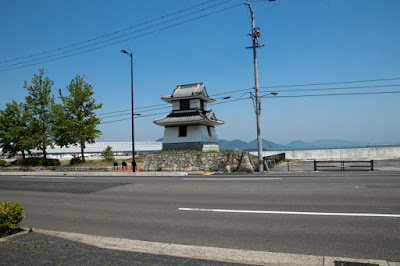 30 minutes drive from Takamatsu Jidoshado Expressway Takamtsu-Chuo interchange.